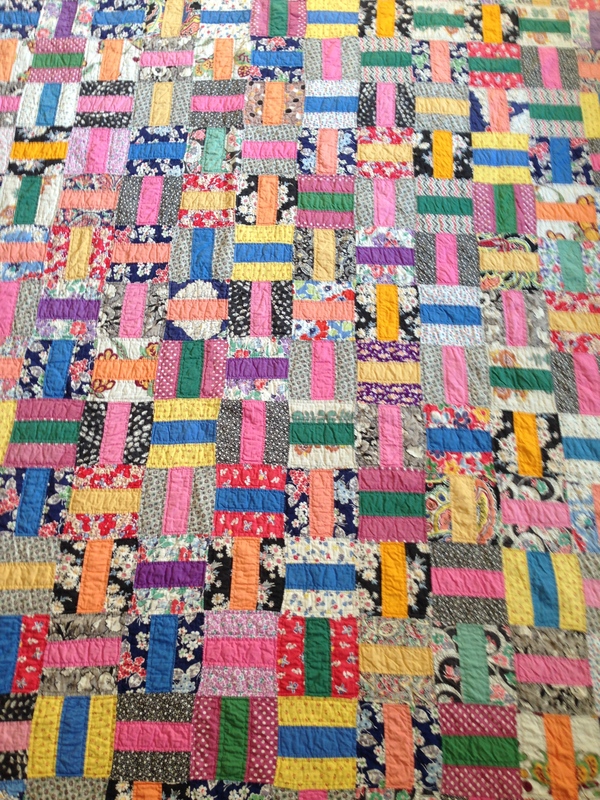 The ‘Collins’ quilt was purchased by Eileen and Bernie Donnelly in 1994 from Peterborough, New Hampshire, USA. It is a lovely old Album quilt with signatures of the Collins family and dated 1849. The names on the quilt are Thomas G. Collins, Samuel B. Collins, Smith Collins, Daniel Collins and Mrs Lewis Collins. They also added their location as Halifax and West Halifax. The block is a simple but appealing Album Block. There are 49 blocks set on point with an alternate plain block in a lovely double pink and white floral. 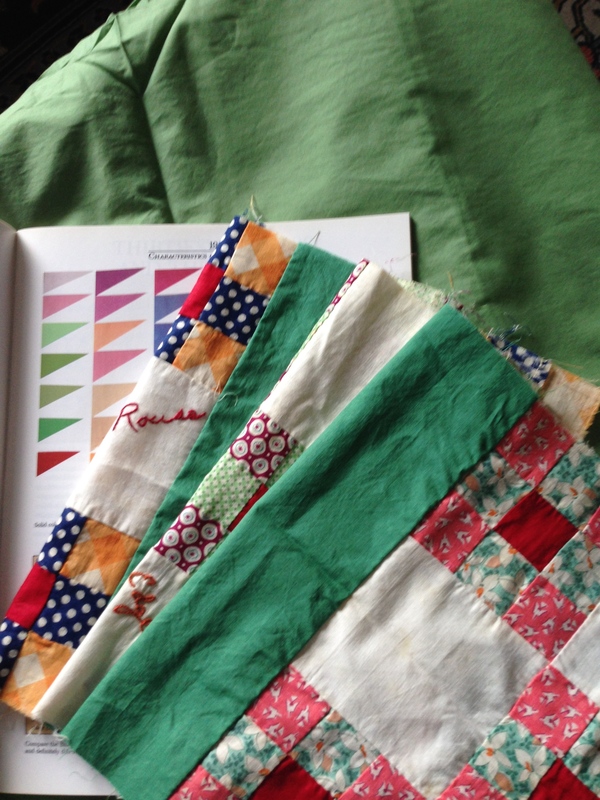 The blocks are pieced from scraps so there is a good variety of interesting fabrics to study. 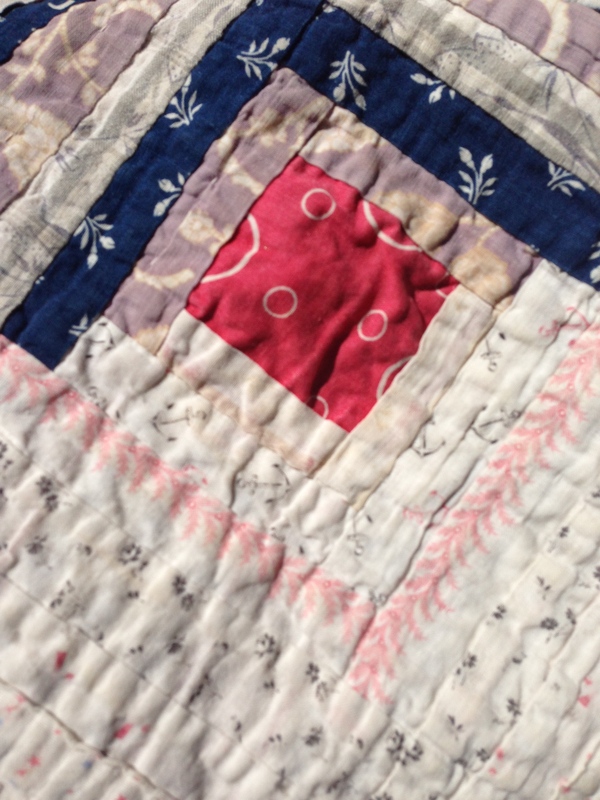 There is some wear to this quilt due to its age and it appears to have been well used. Eileen has noted that a brown fabric has disintegrated, due to mercury being used in the dyeing process of brown fabrics in those days. Eileen has carefully stitched tulle over these areas to protect the fragile fabrics. The quilt backing is a plain cream calico. 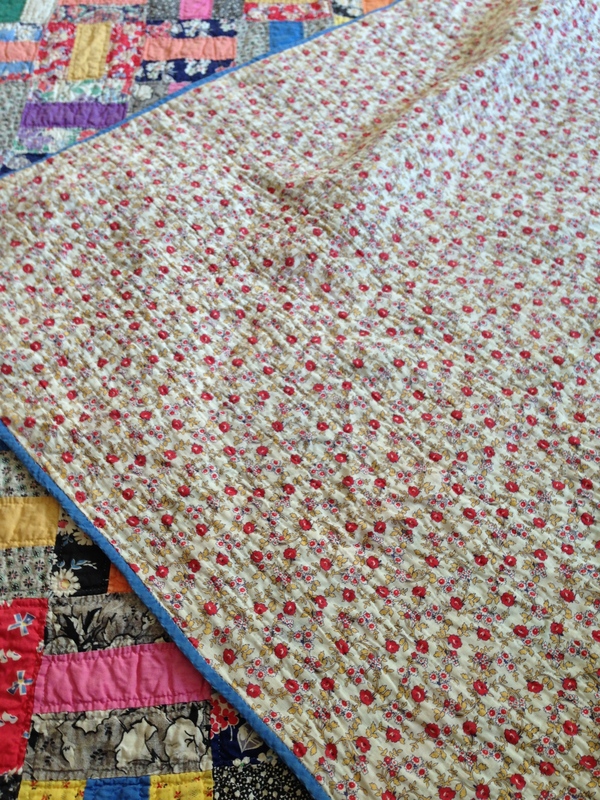 The quilt is hand pieced and hand quilted. Tulle stitched onto the quilt to protect a fragile area. Bernie researched the history of the family and traced the Collins family to New England. Bernie traced the family back to 1740 to a Daniel Collins who married Alice Pell in New London, Connecticut in approximately 1762. 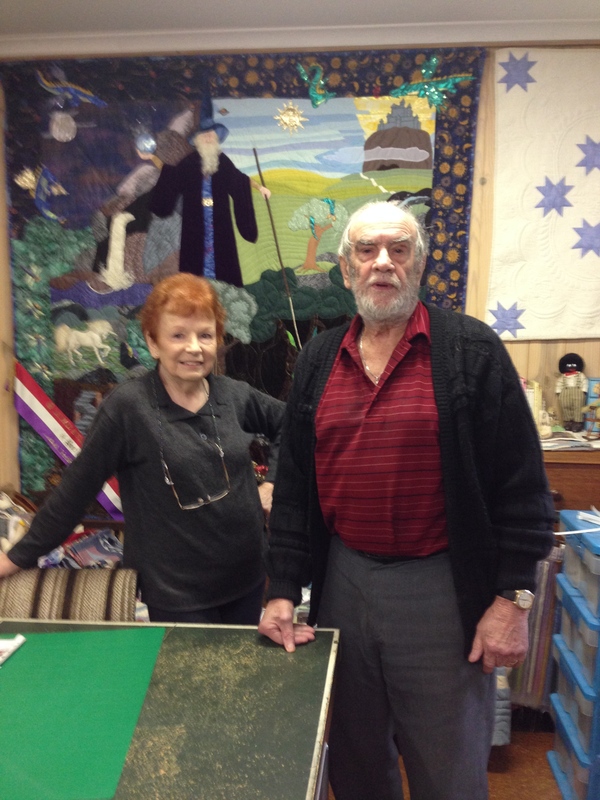 Daniel and Alice were the Great Grand Parents of those who signed the quilt. Bernie also found a Robert Collins who married Ruth Browning in New London in 1809. They had 10 children including Lewis 1817, Daniel 1819, Samuel 1823 and Thomas G. 1831. These signatures are on the quilt along with Mrs. Lewis Collins. (perhaps she was widowed). Thank you Bernie and Eileen for the wonderful research and preservation work on the ‘Collins’ quilt and for providing me with the information. Winter is well underway and the longer nights offer a great opportunity to settle in for a good few hours of hand quilting. 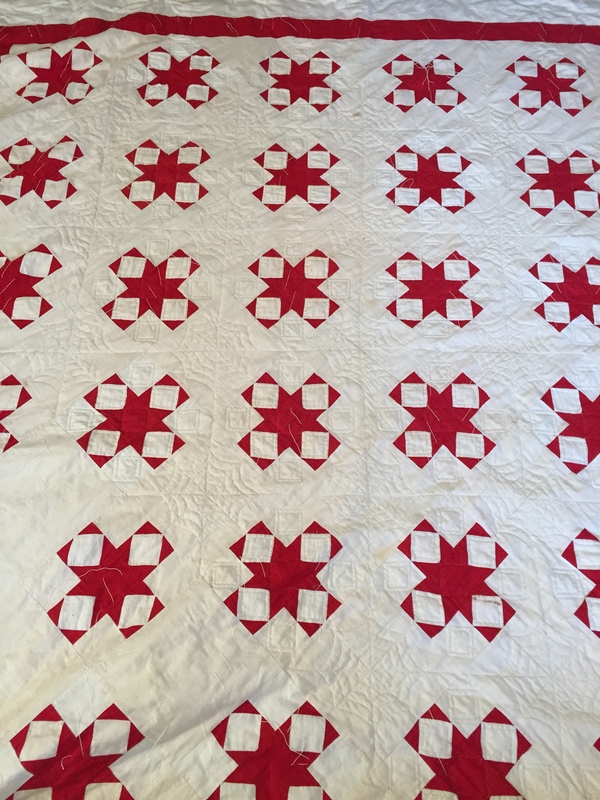 Antique Red and White Star quilt. 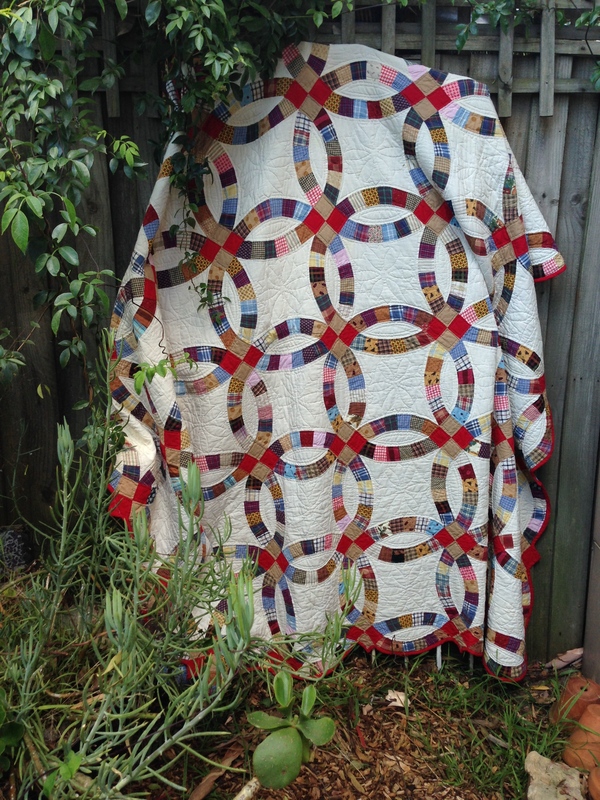 Seven Sisters quilt – hand pieced and hand quilted. Peony Rose in French General. Tax time is here. Receipts, financial statements and paperwork needs sorting and filing. It is also an opportunity to reflect on our quilt making and to take stock of our achievements so far. I keep a list of my sewing projects including quilts I plan to make in the future and quilts waiting to be quilted. Checking over my 2015 list I think at this point in time I have made progress. I finished quilting my Seven Sisters Quilt. This is heavily quilted with triple Baptist Fans, so the quilting took some time. 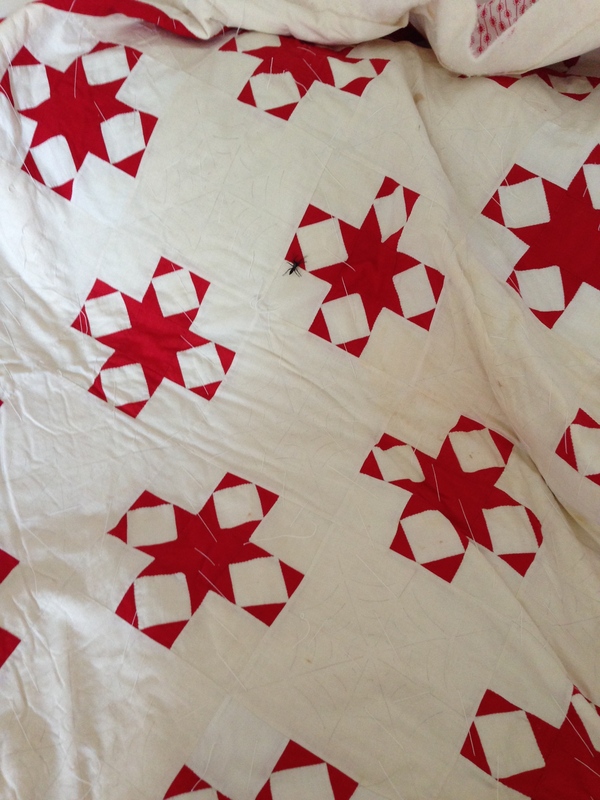 The quilting on the antique red and white star quilt is going well. I am quilting the spider web design in the plain blocks. My next quilt in line for quilting is a scrap quilt, which I call Paths to Peace – this is my wish for peace in our time. A few other odds and ends have been finished and started. 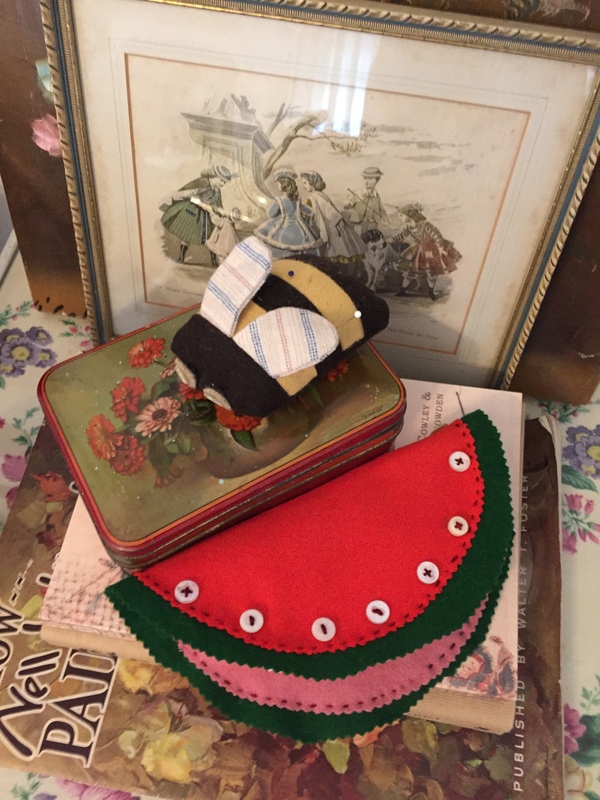 My sewing room has had a tidy up and I have taken stock of projects bundled into boxes. I am hoping to finish piecing my Peony Rose quilt before Winter’s end and will be looking forward to starting a new project. 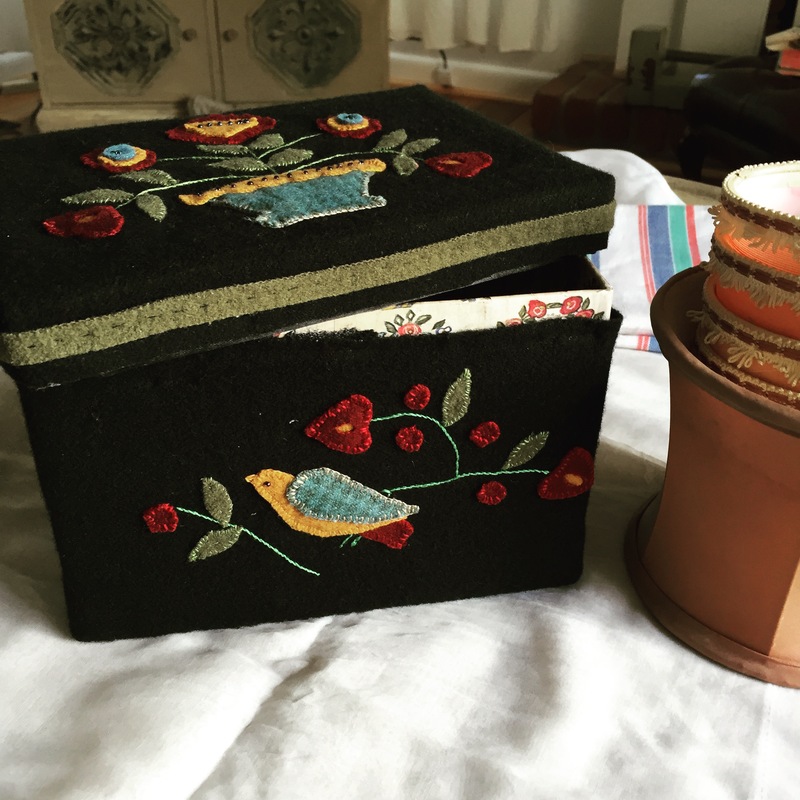 Nellie’s Sewing box – A Quilted Crows kit – finished. 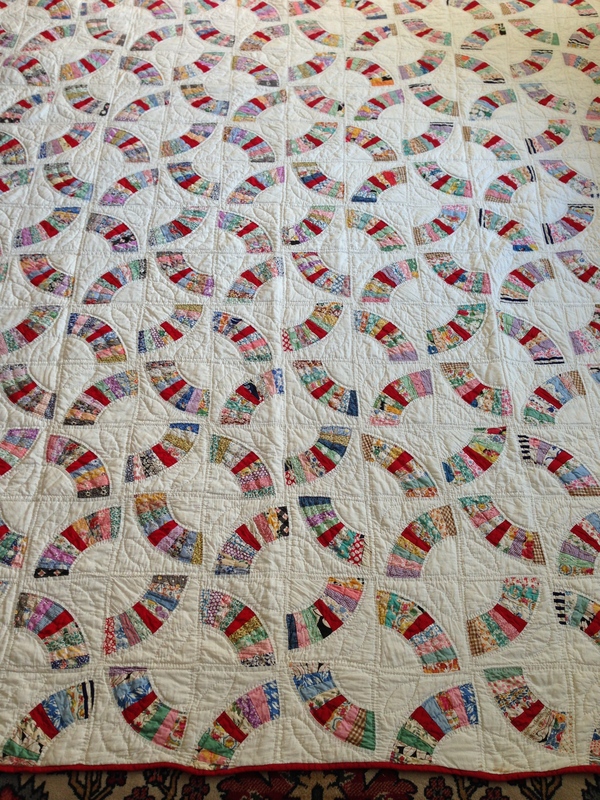 Jelly roll quilt – machine quilting in progress. Scrappy Churn dash top finished. New rug hooking project drawn up. I am looking forward to a busy second half of the year. Wishing you all productive months ahead, Janette – The Plain Needlewoman. If You wish to take a trip around the world today, you only have to book a ticket with an airline and off you go. Paris, London, New York, Rome or Melbourne can be your destination. To quilt makers of the grand quilt making epoch of the Thirties and Forties, a trip around the world would have been an incredible dream. However, during this era ‘A Trip Around the World’ was made not by boat or plane but by cutting numerous tiny squares of fabrics and stitching these squares together to create quilts of great style and design. These quilts also demonstrate a sophisticated use of colour and pattern. 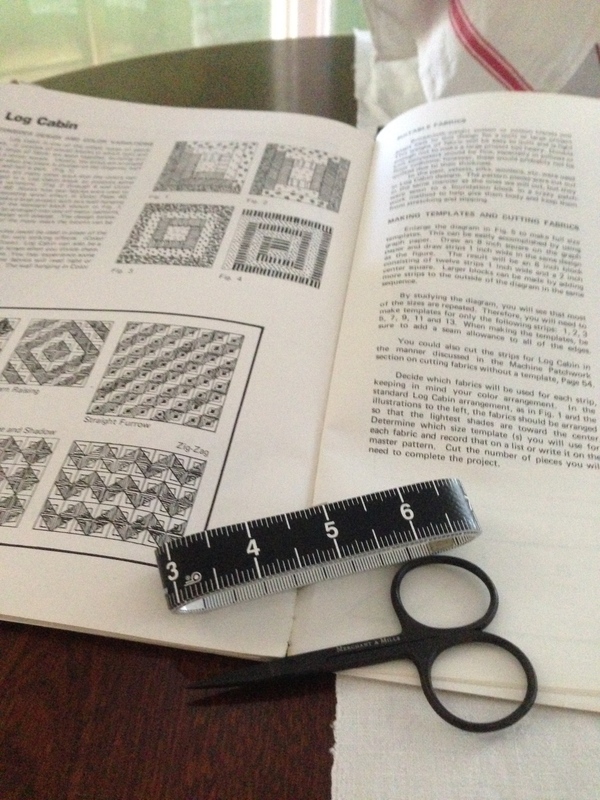 Tiny Squares – these measure 3/4 of an inch finished. In Barbara Brackman’s Encyclopedia of Pieced Quilt Patterns these two Trip Around the World designs are to be found. The second design is accredited to Holstein and also called Trip Around the World. My quilts represent examples of both these designs. In the book ‘The World of Amish Quilts’ by Rachael and Kenneth Pellman. The Pellmans state that this arrangement of squares was a favoured design predominantly made in Lancaster County, PA. from where it spread to other Amish settlements. The Amish call this design Sunshine and Shadows. These quilts were made in solid colours and nearly always featured at least one large border. It is also stated that ‘the squares are arranged by colour to form a series of brightly coloured expanding diamonds. Sometimes the squares are tipped on point to form a pattern of squares. 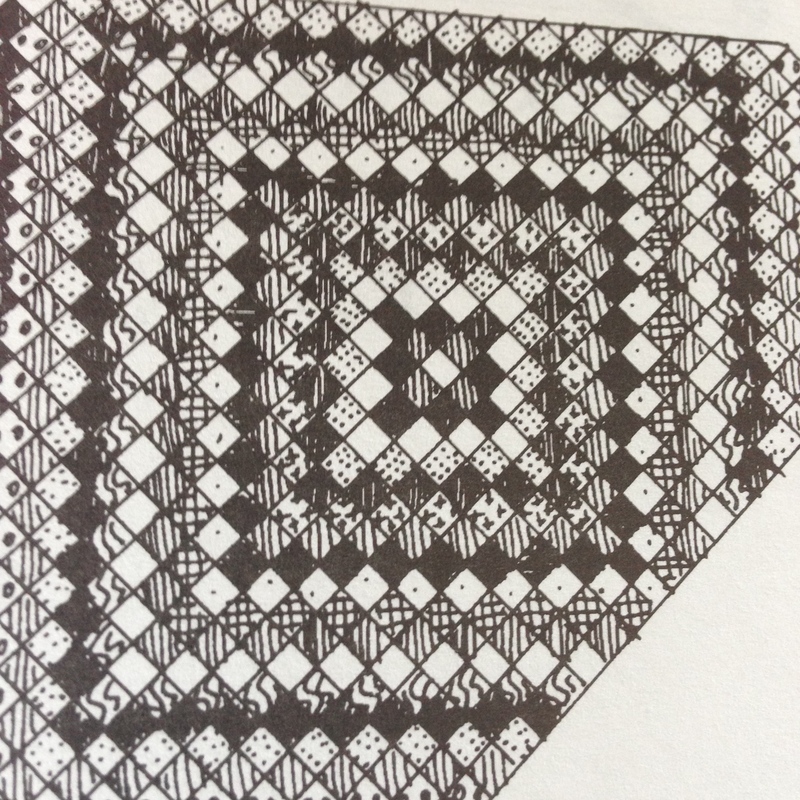 The Pellmans also state the ‘the Sunshine and Shadow arrangement of squares worked in printed fabrics rather than plain, may be called Trip Around the World and is often made by non-Amish women’. I purchased the Trip Around the World quilt from the collection of The Donnellys. 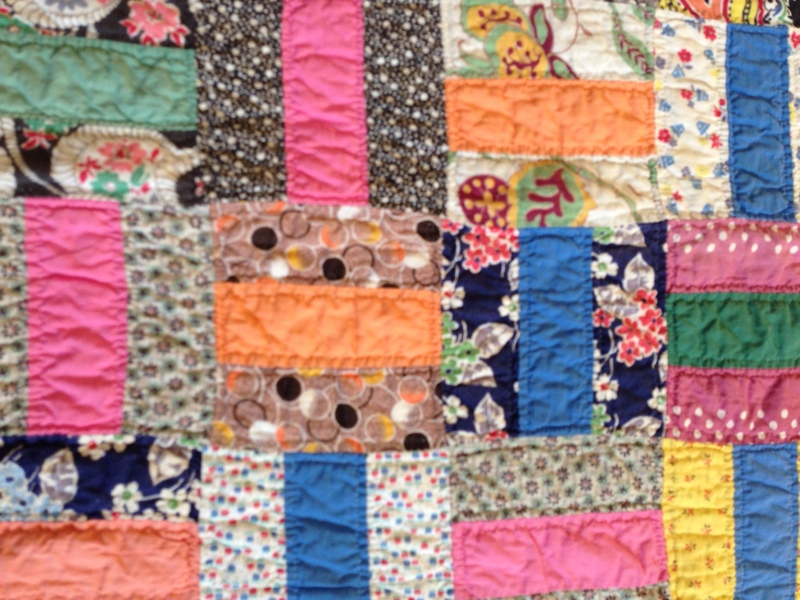 They bought this quilt in Groton, Massachusetts in 1995 at The Quilt Loft from Dianne Reece. It is hand pieced and quilted. 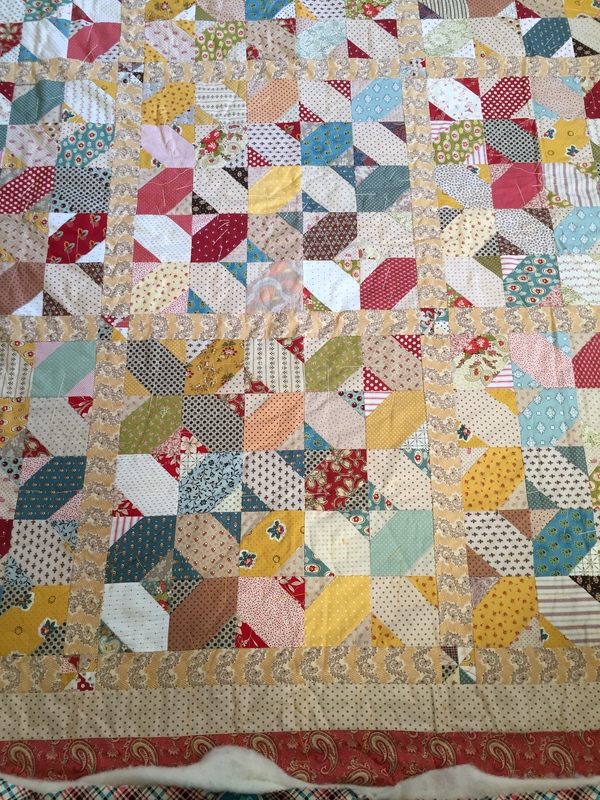 The squares measure 1 inch finished and the quilter has used a great variety of fabrics, including dimity, feedsacks, shirtings and early dress fabrics. 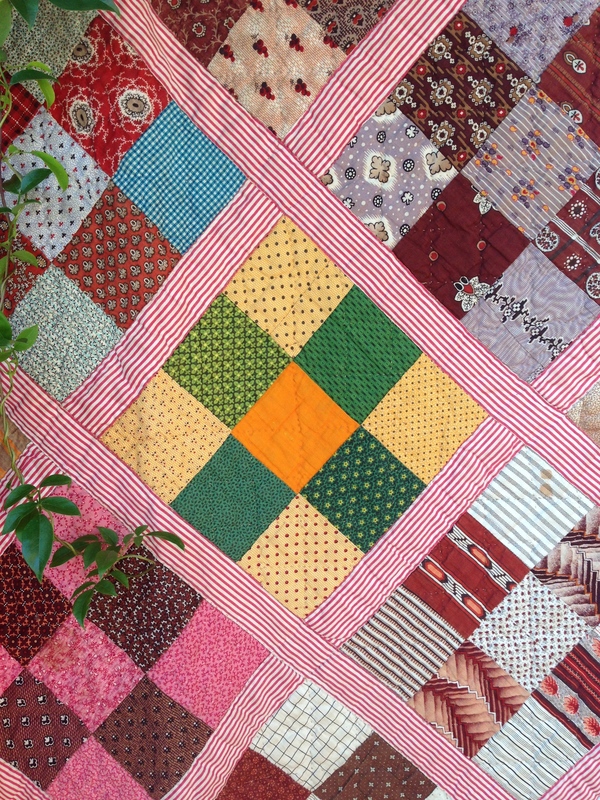 The inclusion of the solid red and black in this quilt shows the quilt maker’s great flair for colour and design. 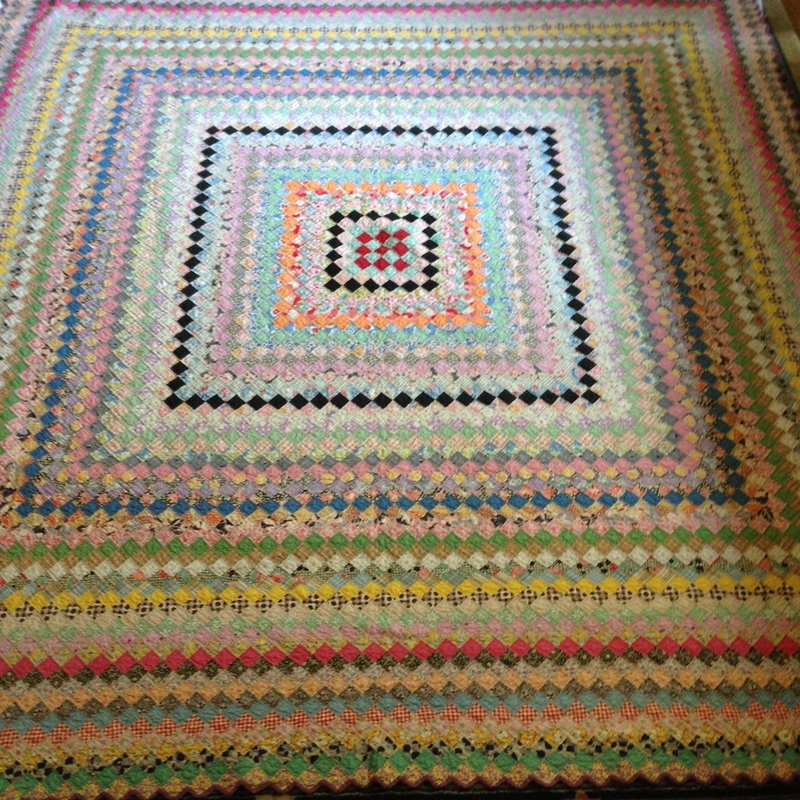 The quilt contains 3,125 squares. 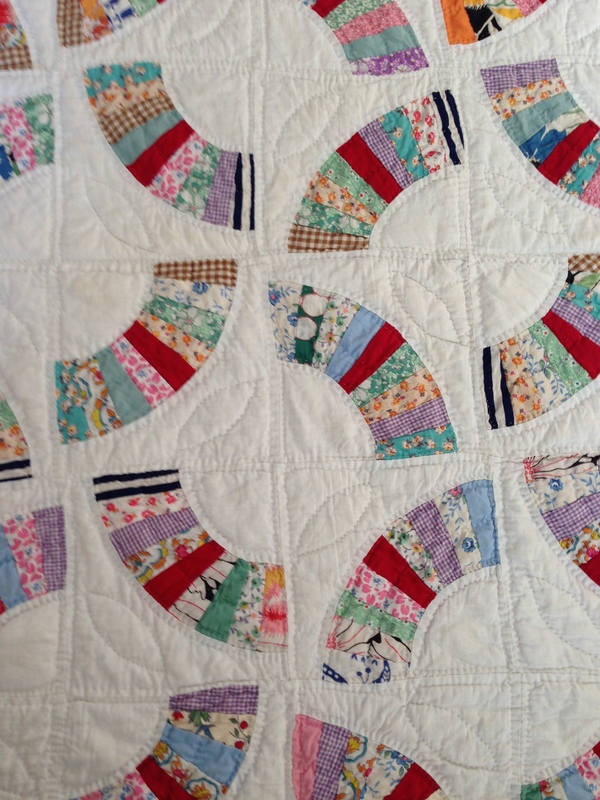 The backing is a plain white homespun which displays the lovely hand quilting to great effect. 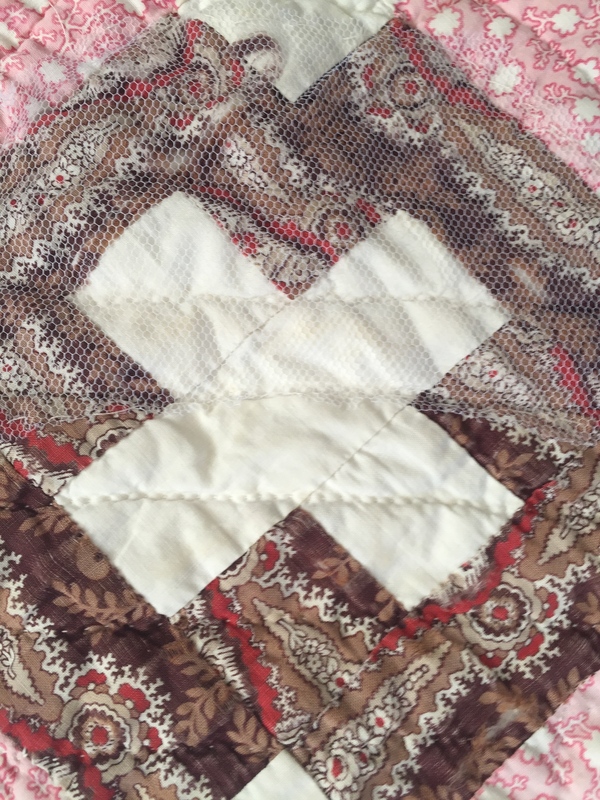 The binding on this quilt is noteworthy as it is stitched around the edges of the tiny squares, creating a dainty scallop finish. 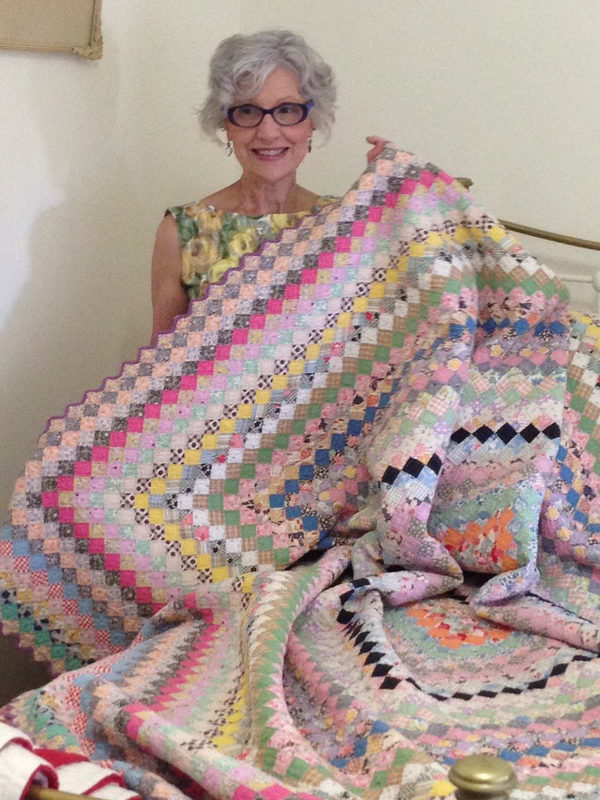 The second Trip Around the World Quilt in my collection was bought as a top from the quilt collector Jan Baker. I have basted this quilt and hope to start quilting it this year. The squares in this top are even smaller, three quarters of an inch finished. This Trip Around the World is an example of the quilt maker tipping it on point. The edges finish square so there is no fiddly binding to be done. 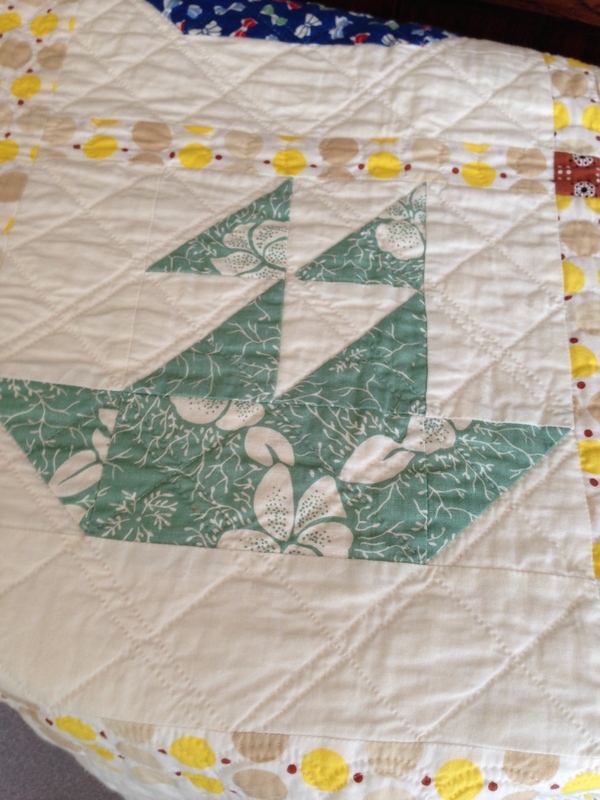 This quilter came up with a nice border design for her quilt. 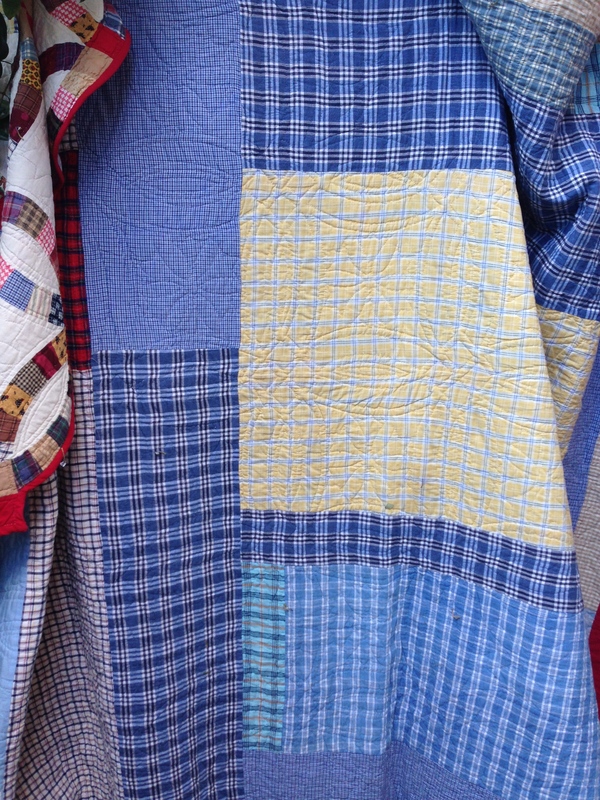 The fabrics in this quilt appear to be very well co-ordinated. The pretty, little floral patterns match up with a complimentary solid colour. 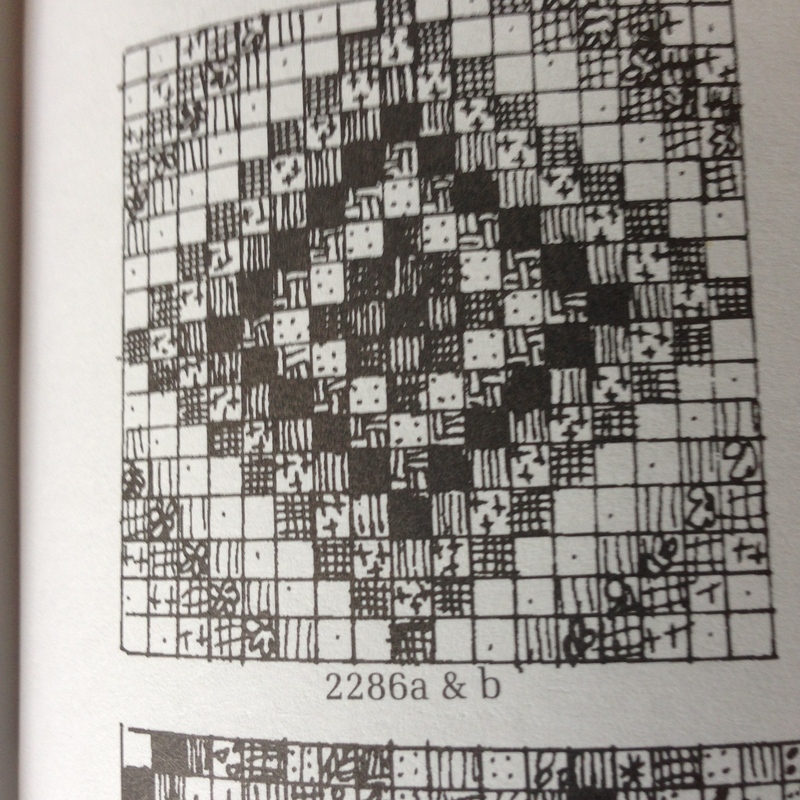 On studying this quilt, I wonder if it is an early example of a kit quilt, which were available at this time. Well, I will have lots of time to examine the fabrics and think about the original quilt maker when I undertake the task of hand quilting it. Here in Melbourne, where I live Summer is well underway. January arrived in a blaze of heat. Hot, dry and windy conditions prevailed and we are once again faced with the prospects of bush fires. 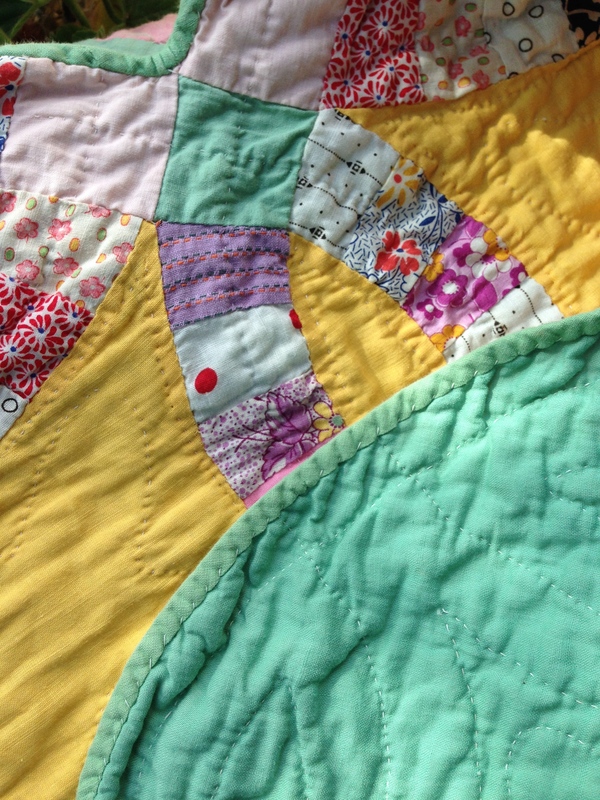 With temperatures in the high thirties, dare I say it is almost too hot for hand quilting. As I always have a few projects on the go, I turn to my hand piecing when the temperature soars. 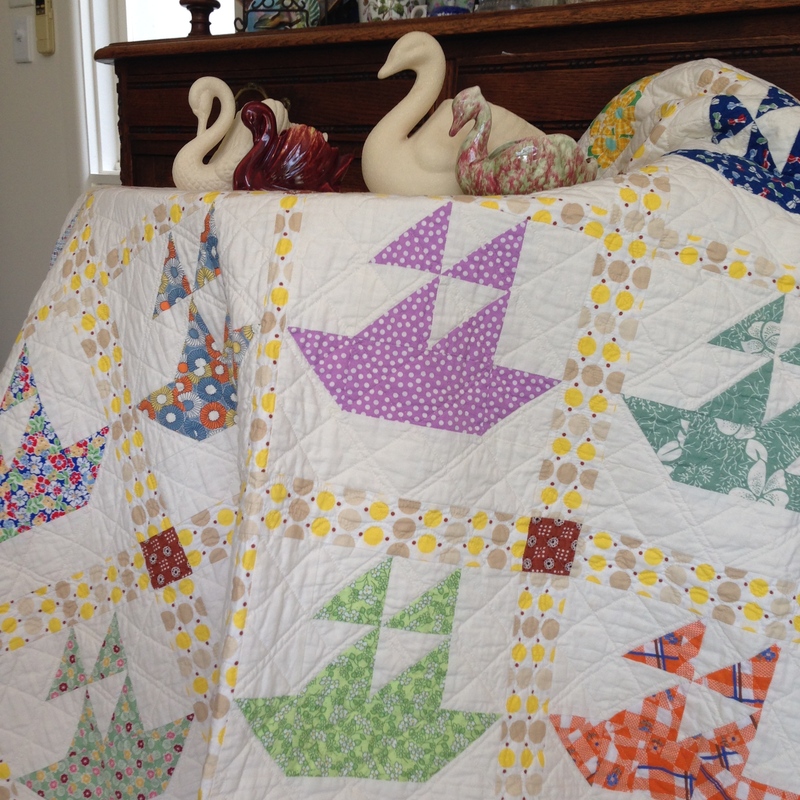 My ‘Sail into Dreamtime’ quilt brings to mind a Summer’s day spent out sailing on our bay with cool breezes blowing off the water. The pretty fabrics in this quilt which are either reproduction thirties or vintage fabrics from this era, transform me to another place and time. 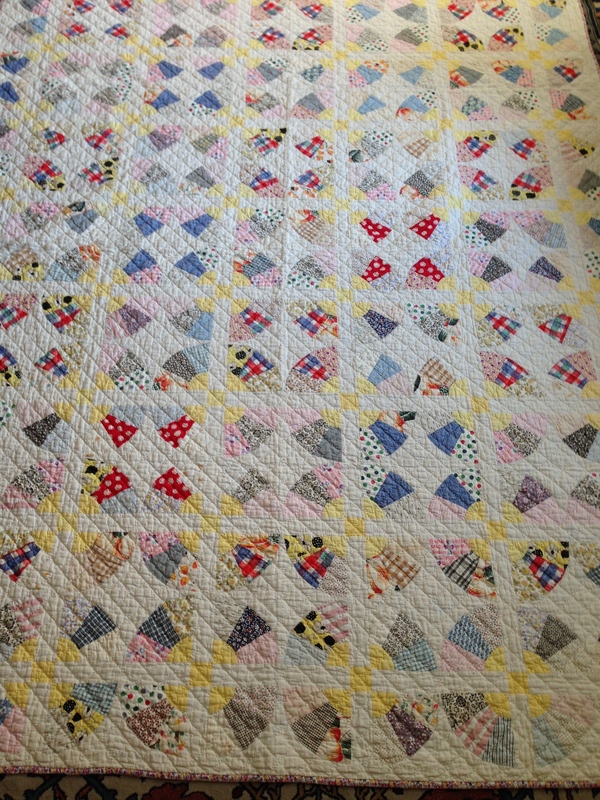 I was inspired to make this quilt after being shown some old quilt blocks from 1939, that were signed and dated. 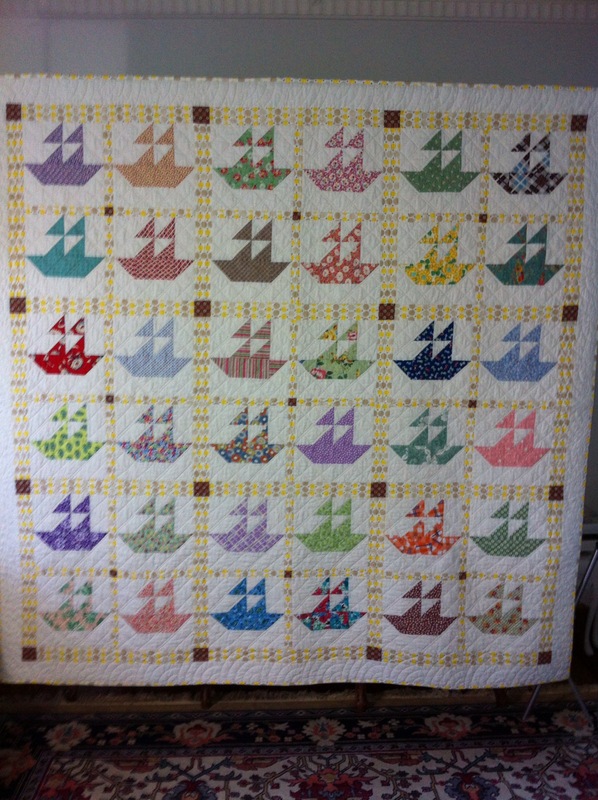 I drafted my pattern from the original blocks and made 36 sailboat blocks using fabrics from my collection. The quilt is machine pieced and hand quilted. 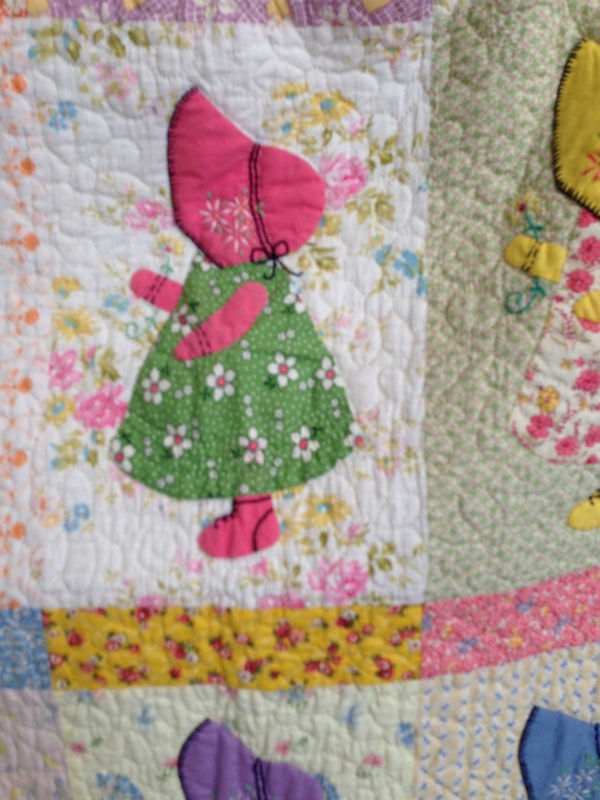 Sunbonnet Sue quilts were very popular in times past. This quaint design evokes little girls in pretty dresses and bonnets playing happily in shady gardens. 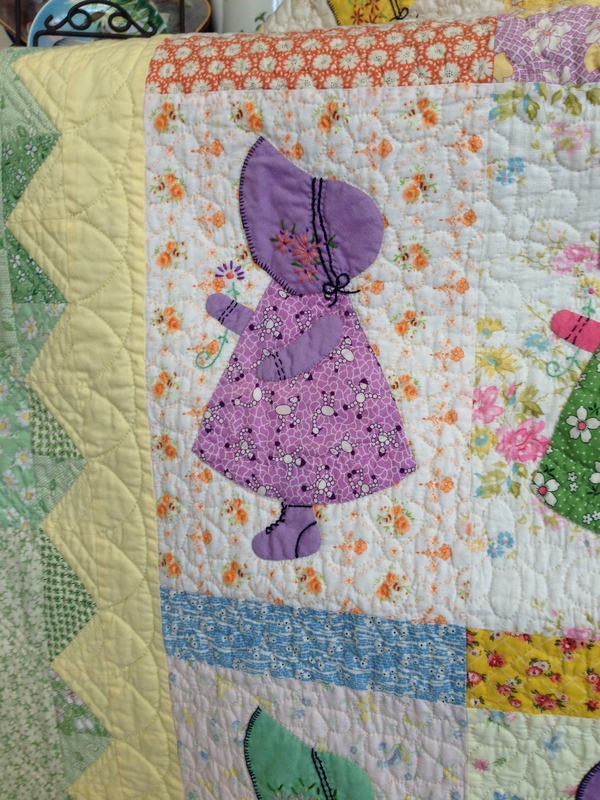 Studying these quilts transports me back to another time, when girls wore floral dresses, bonnets and cute little boots. It must certainly have been Summer. 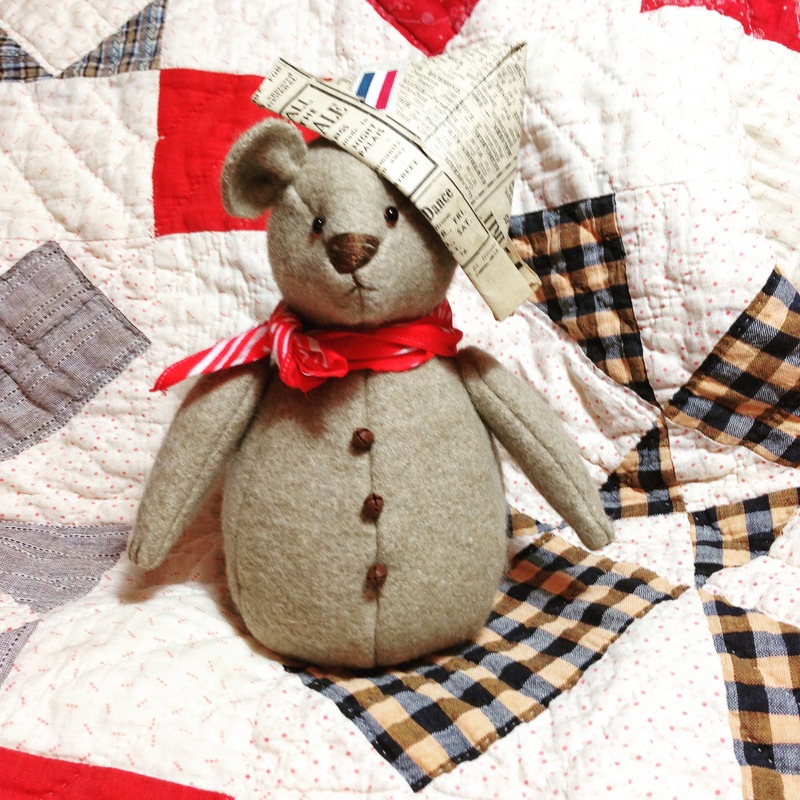 This quilt is once again inspired by the wonderful quilts made during the Great Depression. This little girl is my own design and it is hand appliquéd, embroidered and hand quilted. Choosing the dress fabrics and co-ordinating them with just the right shades of solid pastels for the bonnets and boots was a wonderful opportunity to look over lots of pretty fabrics. 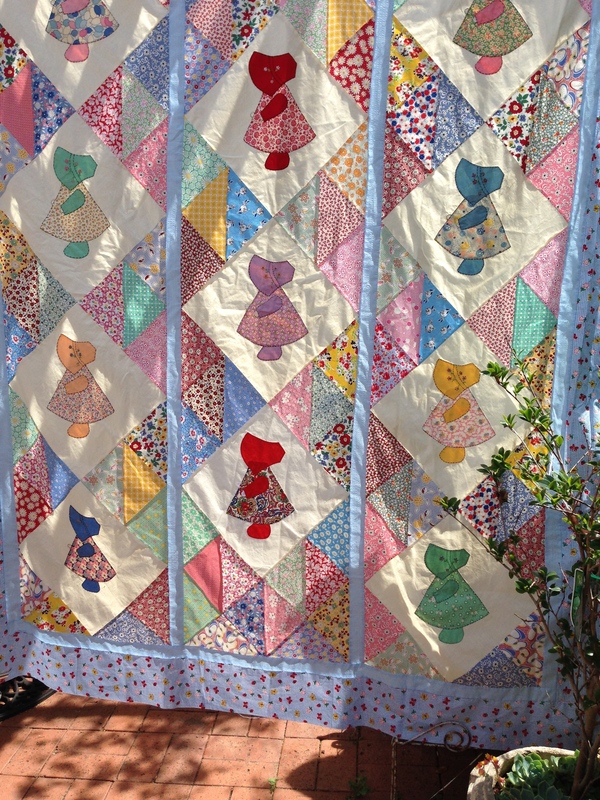 I purchased ten Vintage Sunbonnet Sue blocks from ‘A Piece of Cloth’ and made one more from the original design to construct this quilt. 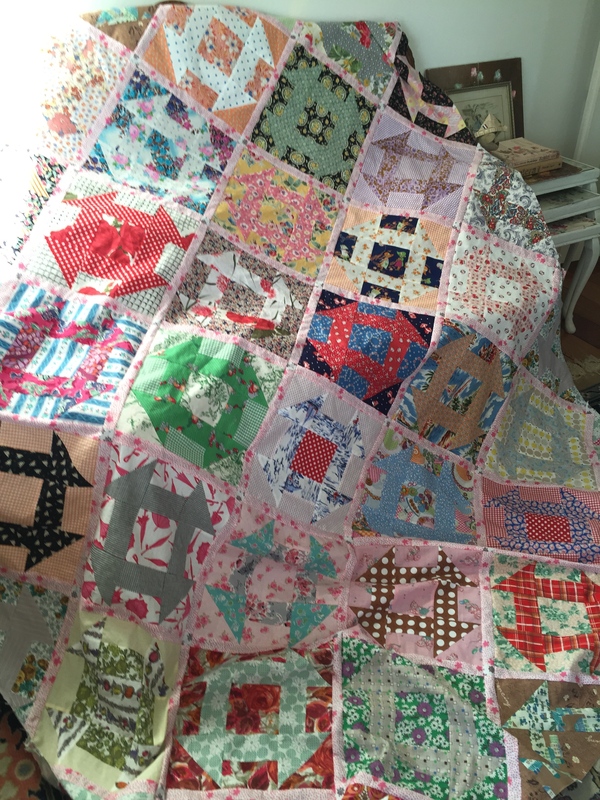 By setting it in a zig-zag setting I was able to create a good size quilt and preserve the beautiful work started by another quilter many years ago. These girls are appliquéd and finished with a black running stitch around the appliqué pieces. 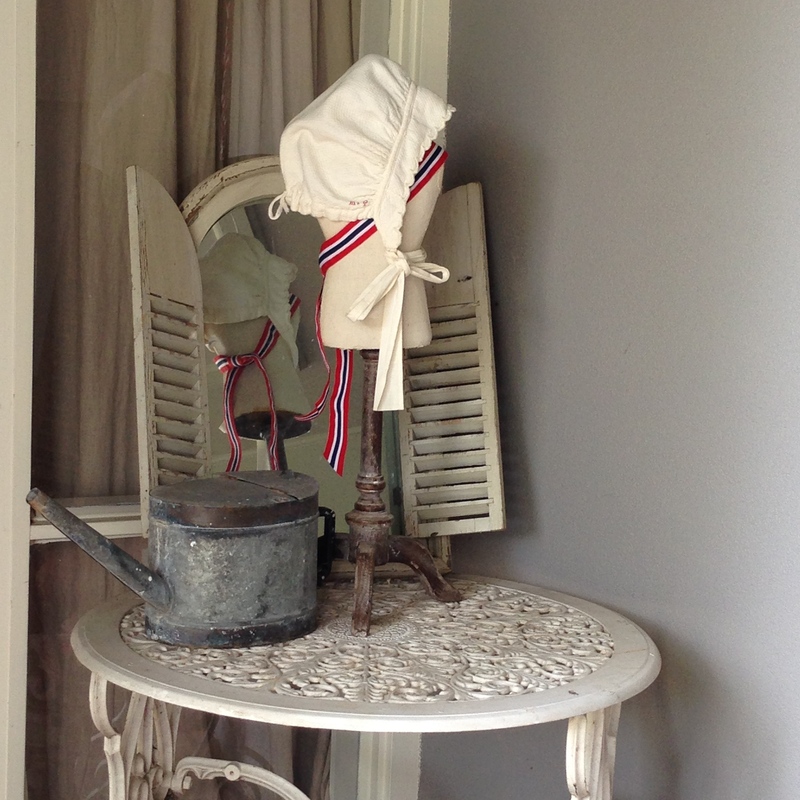 The reproduction and vintage fabrics worked well together. It is amazing how similar the reproduction fabrics are to the original. I hope these quilts have carried you to another place and time. Either to escape the heat of Summer or to send you Sailing Into Dreamtime, perhaps looking forward to warmer days to arrive. 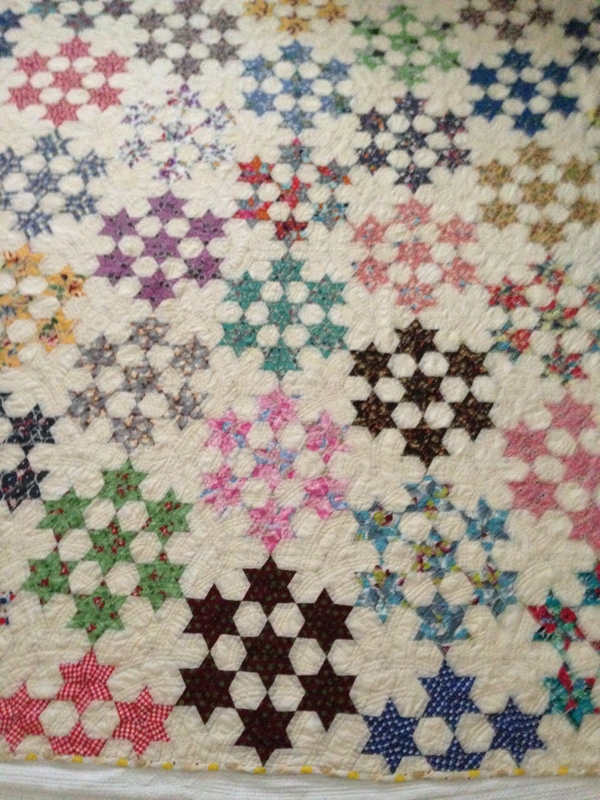 This quilt is another Variable Star pattern. It was probably made late 1890s or early at the turn of the 20th Century. 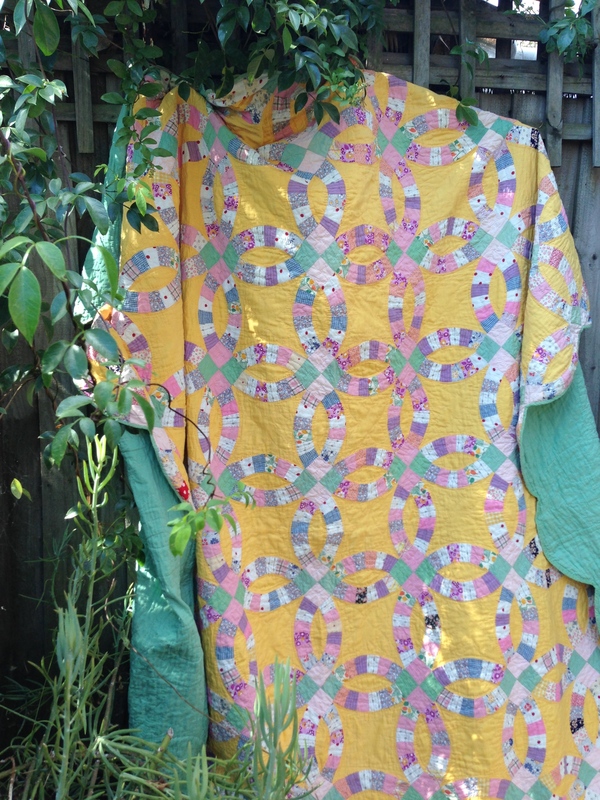 I purchased the top from the quilt collector Jan Baker in 2009. This quilt is basted and is next in line for hand quilting. 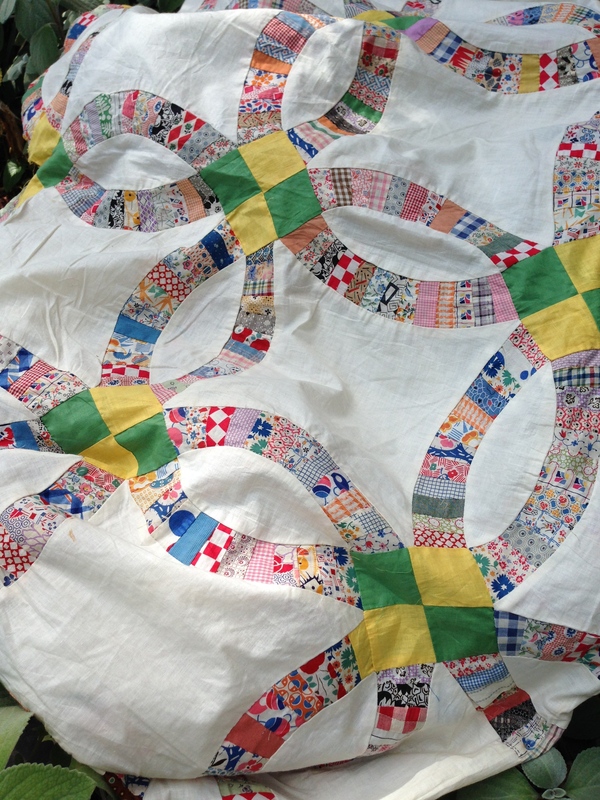 I am quilting my Seven Sisters quilt at the moment and have a long way to go on this quilting project just yet. I was taking this photo of the quilt to post on a Facebook page and as I took the photo a spider crawled out from the folded quilt. Can you see it in the photo? As I am not afraid of spiders and never kill them (it is bad luck) I caught it and placed it outside in the garden. As I was folding the quilt to put it away, I remembered I had marked this quilt ready for quilting with the spider web pattern. The spider may have thought this was it’s home. As I mark my designs very lightly with a HB lead pencil it may not be visible in the photo. The Spiders web quilting design is a favourite of mine and quilts up beautifully. Can’t wait to get started on the quilting. As for the spider I shall look on this as a good omen for 2015. Wishing you all a very peaceful, kind and wonderful year of quilting and happy days! Fabrics and Styles in Double Wedding Ring Quilts. The Double Wedding Ring pattern was one of the most popular patterns made during the Great Depression Era. Although a difficult pattern to piece it was made many times over. 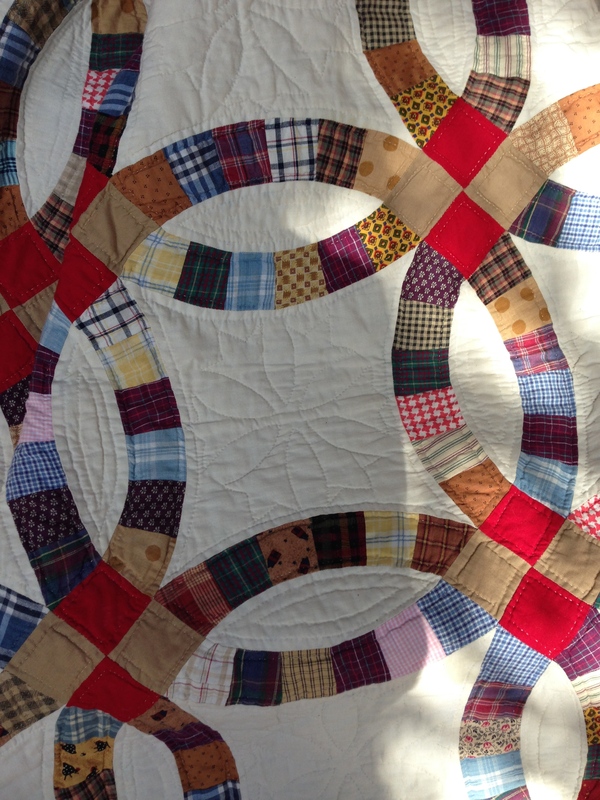 Double Wedding Ring quilts still remain a favourite with today’s quilters. Laser cut templates, paper piecing and books devoted entirely to constructing the Double Wedding Ring pattern are readily available. 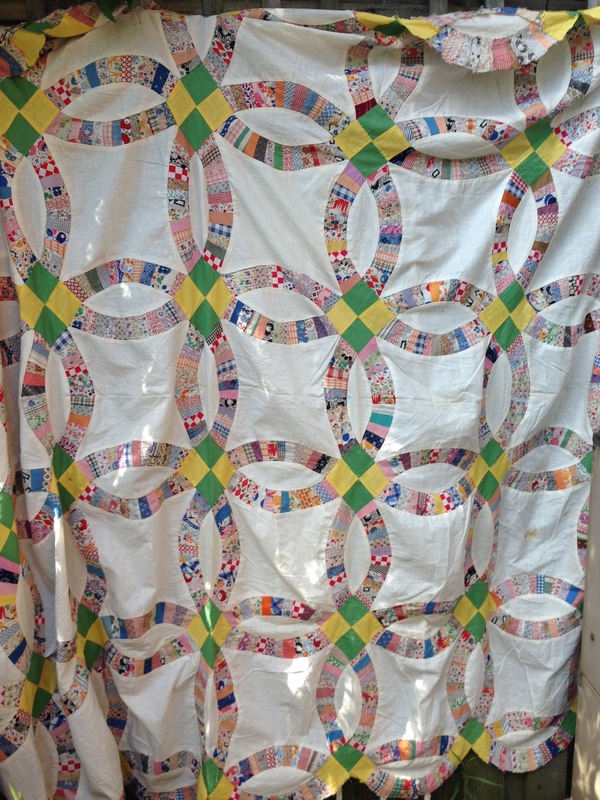 However, the older quilts show some variation of the numbers of pieces of fabric in the arcs. 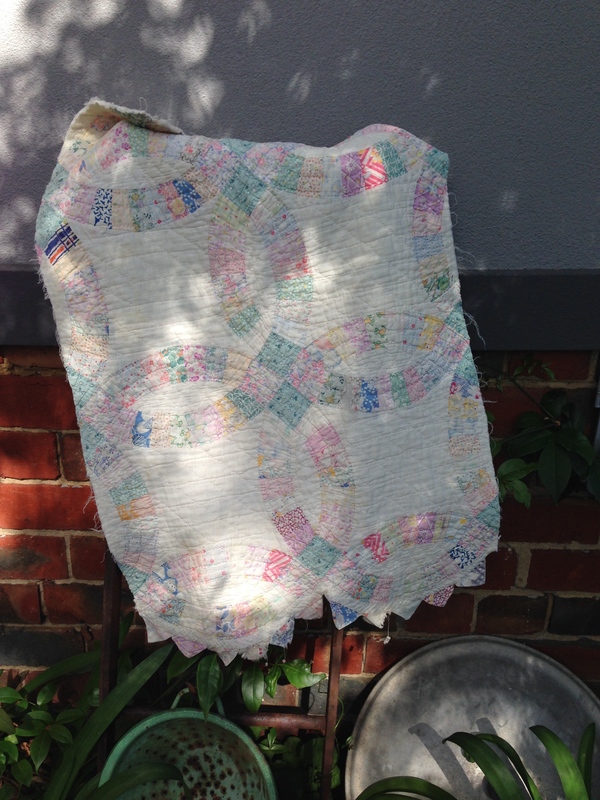 Perhaps patterns were used from the syndicated newspaper columns popular in the 30s or patterns were adapted to make use of what was in the quilter’s scrap basket. 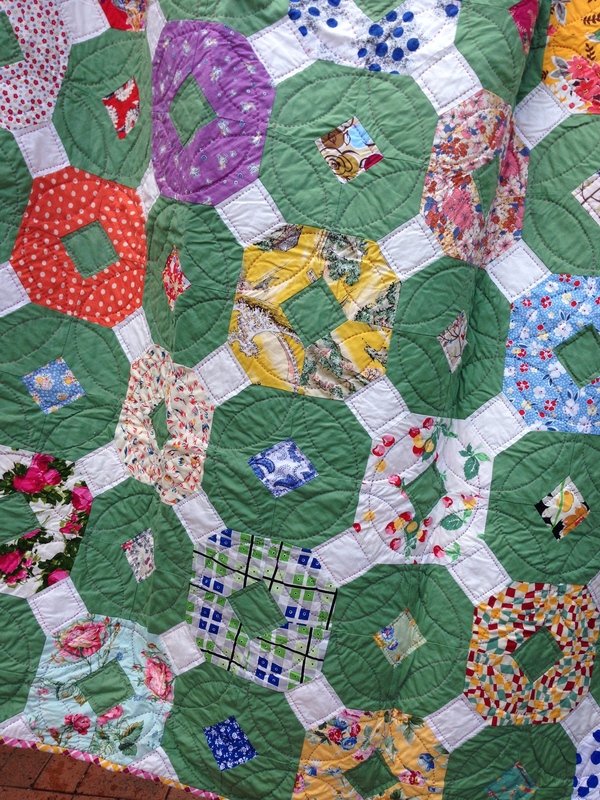 The yellow and green in this quilt clearly identify it as a 1930’s to 40’s quilt. 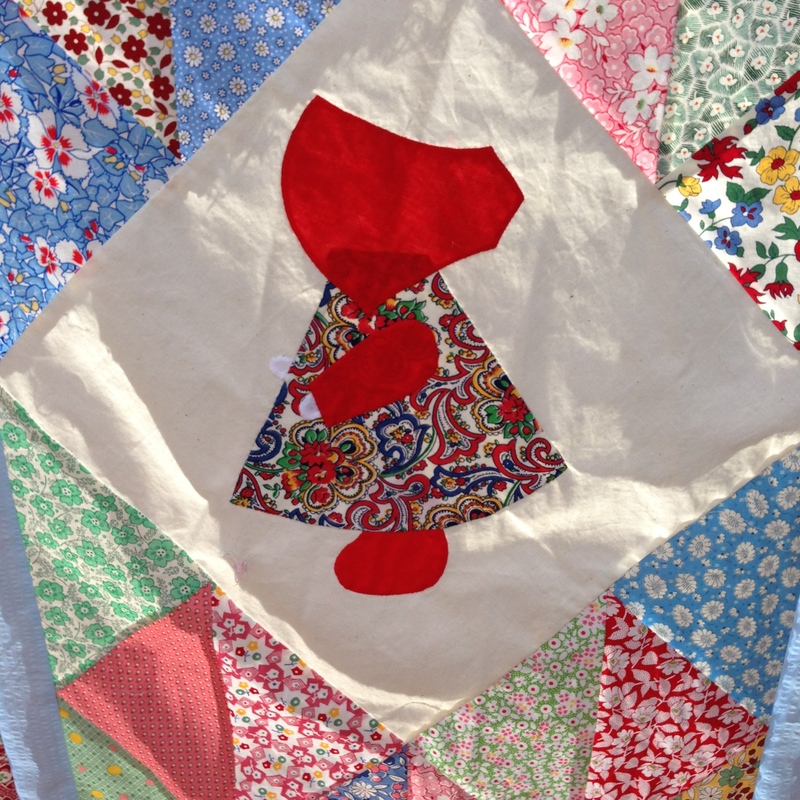 This quilt was probably made from the scrap basket as it also contains shirtings, dimities, plains and a liberal use of a gorgeous red polka dot. The red polka dot fabric reminds me of confetti. 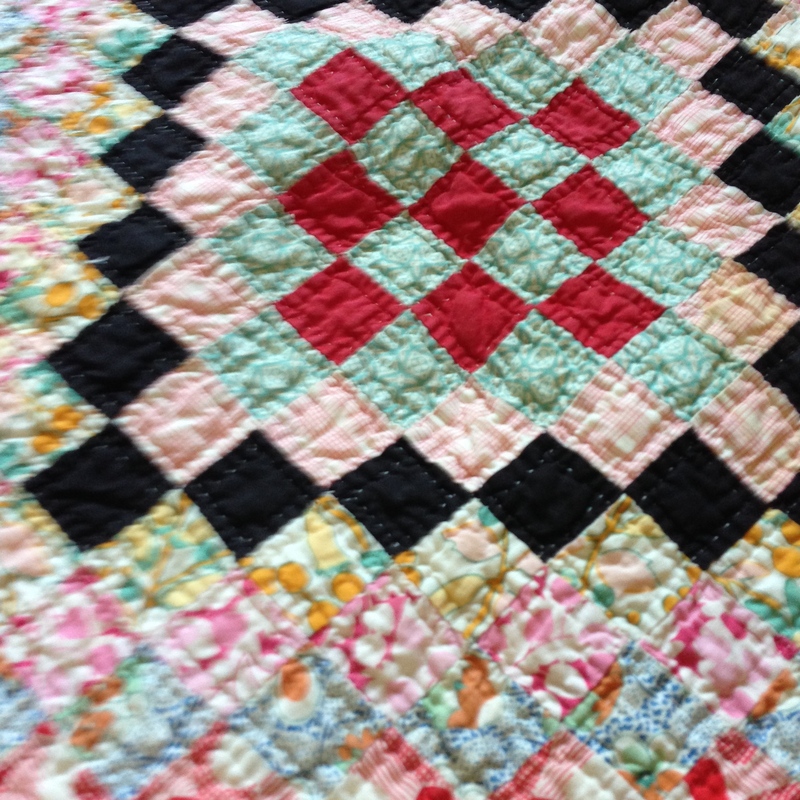 This quilt is beautifully stitched, with six fabric pieces in each arc set against two pinks and a green. The background is yellow and the backing is Thirties Green. The hand quilting is neat and even. 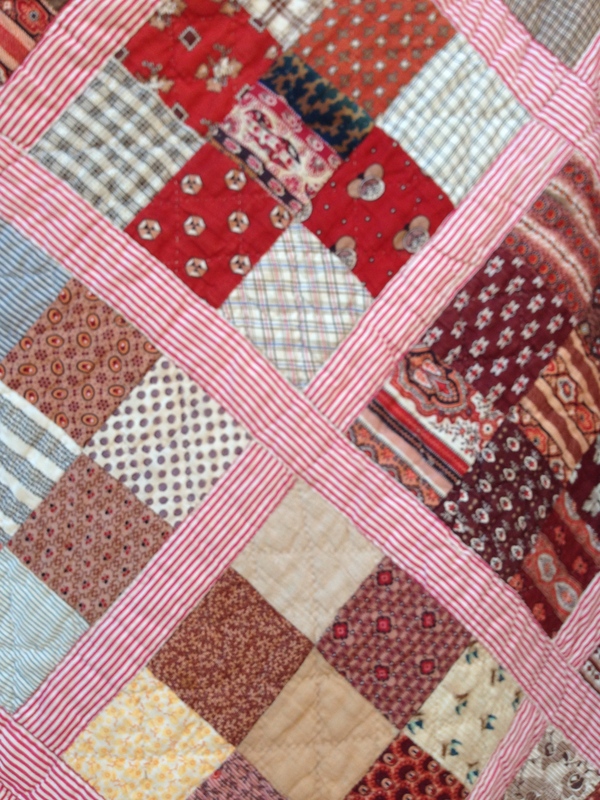 This quilt was purchased by The Donnellys in October 1997 at Buckhannon, West Virginia. 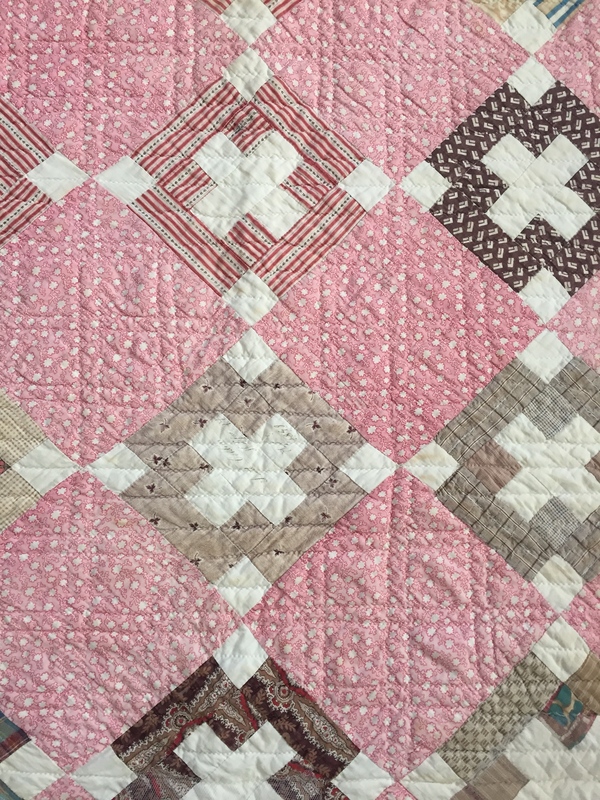 Another quilt from the thirties contains a fabulous array of dainty florals and prints. 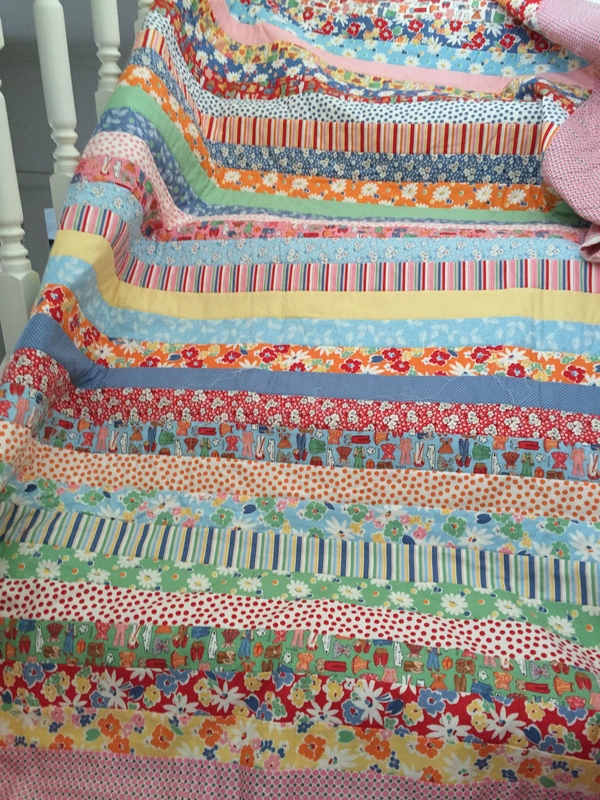 This quilter chose to use 12 fabrics in her arcs, enabling her to use many designs throughout the quilt. The background is a fine weave cotton and the arcs are set with green and yellow. A wonderful collection of prints, plaids, florals, checks, stripes and geometrics were used in this top. 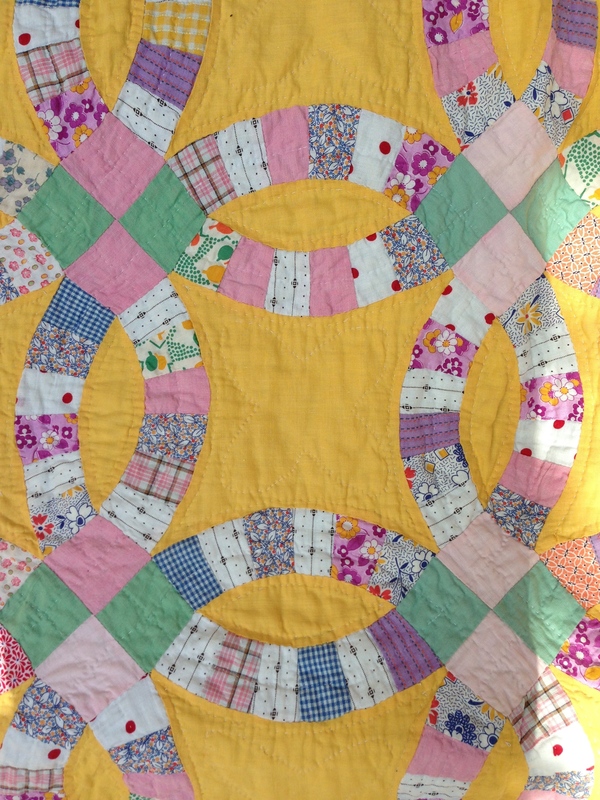 Another example of a 1930s Wedding Ring can be seen in this quilt fragment. 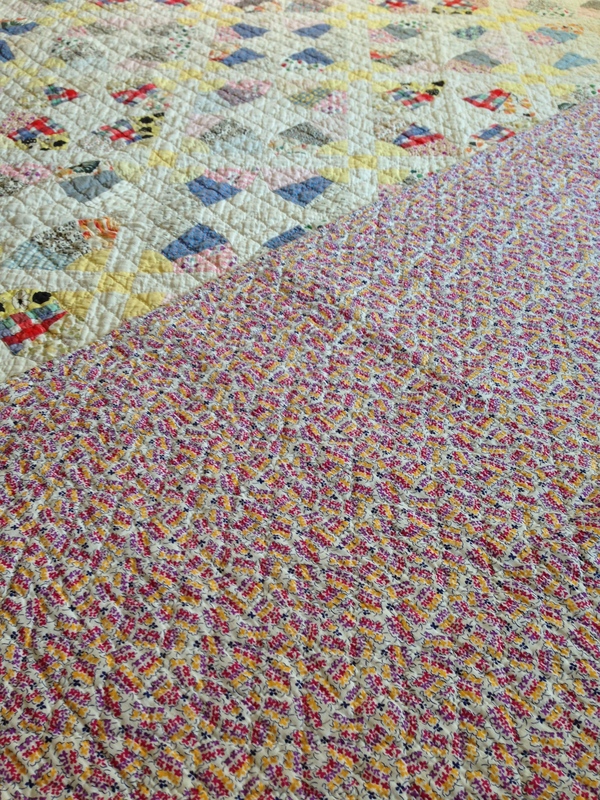 A notable feature of this quilt is the use of Prairie Points to finish off the curved edges. The arcs consist of seven pieces and are set with pink and green patterned fabrics. 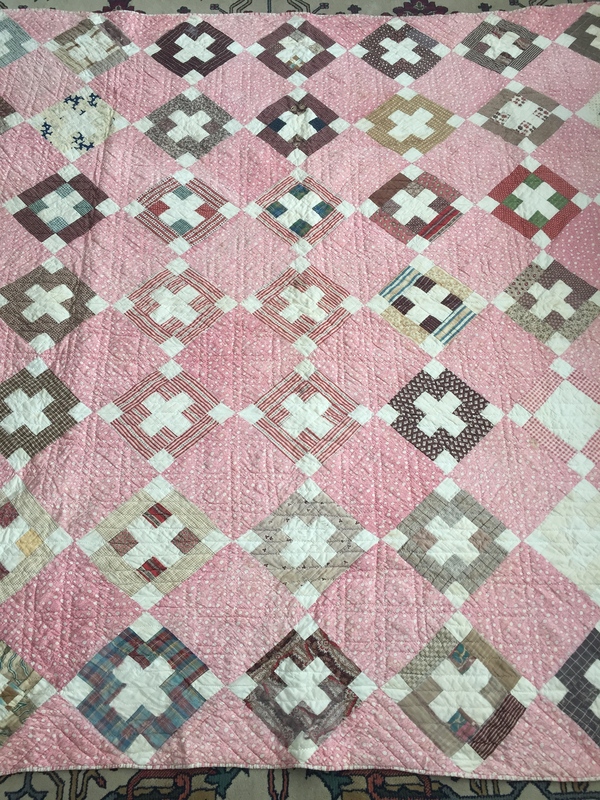 The quilting was done in the Hanging Diamond pattern. I love this little fragment and can only wonder at what an exquisite quilt it must have been. 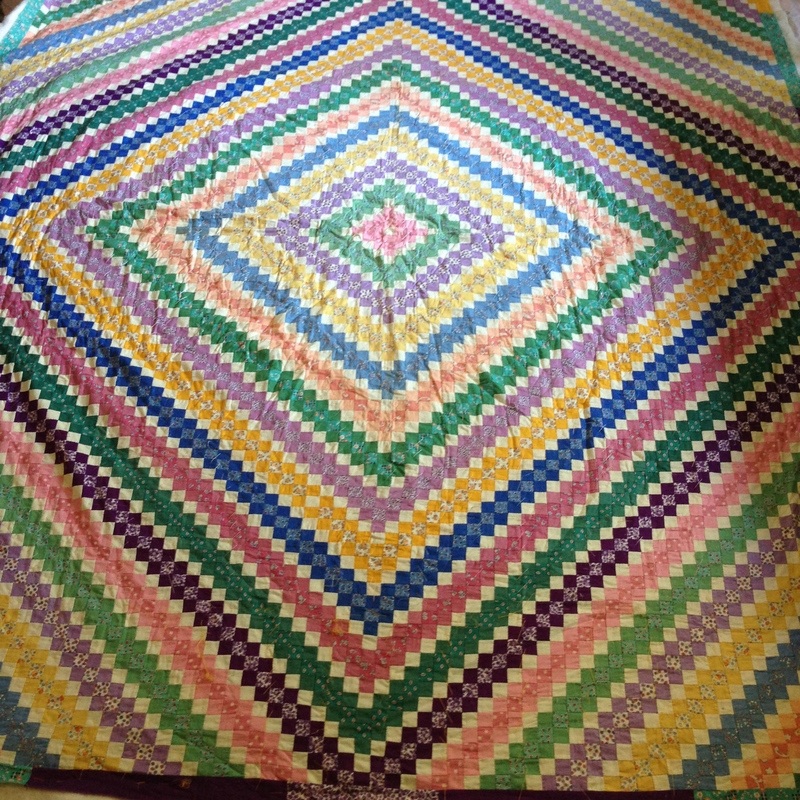 I completed my Double Wedding Ring quilt in 1996. There are six pieces in the arcs and they are set with a red and tan solid. I was inspired to make this quilt from a photo of an antique quilt in a Hallmark Calendar. I used primarily checks, plaids,stripes and geometrics. There are very few florals used in my quilt. I machine pieced this quilt and it is hand quilted. I carried the check and plaid theme through to the backing, using up all the remaining fabrics. 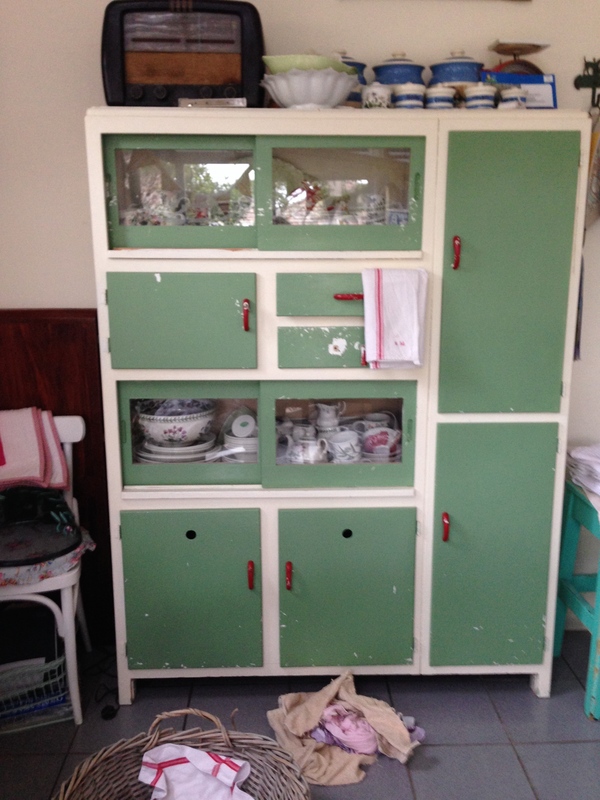 An early childhood memory of mine is of our cream and green kitchen. 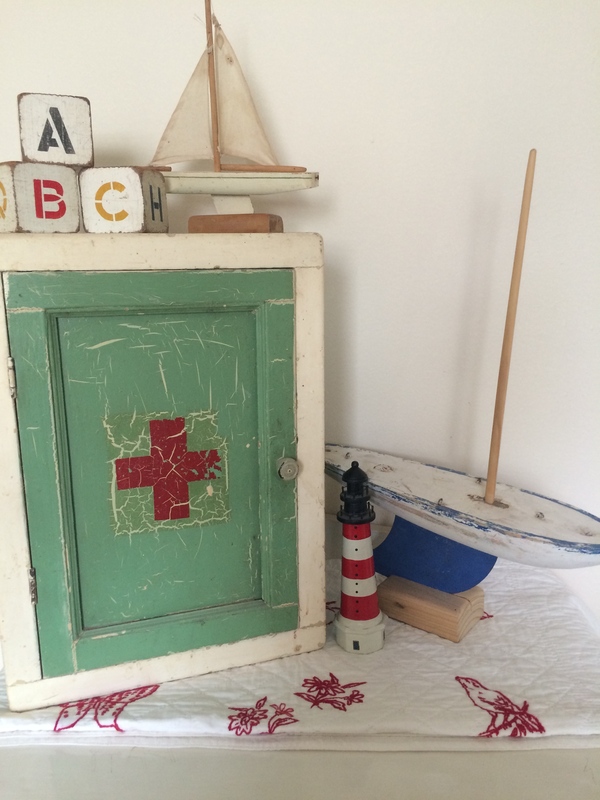 This lovely soft colour scheme was replaced in the 60s by a much brighter colour scheme. 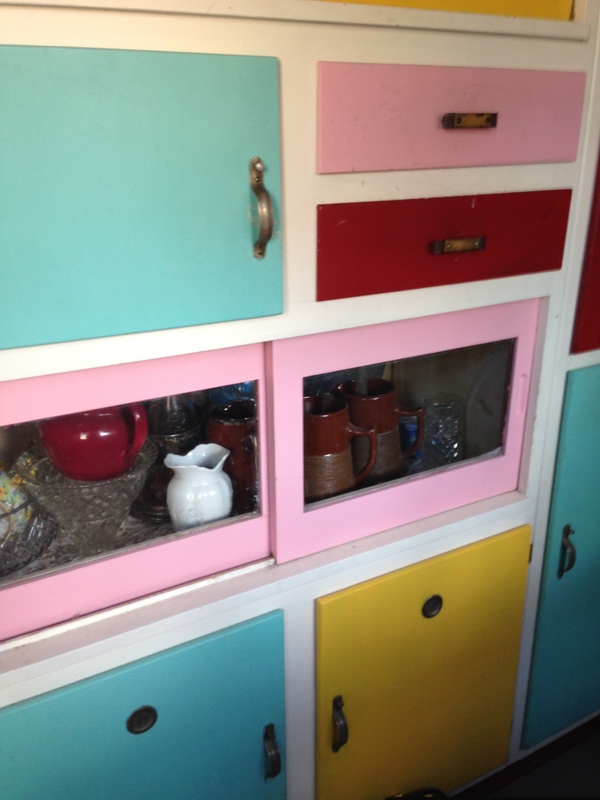 Every cupboard door (and there were many) was painted alternating colours of hot pink, aqua, yellow and red. We thought it was fab. It is understandable following the decades of the depression era and World War 2, that bright colours became popular as the world celebrated peace and prosperity. Nephew states ‘Many of the colours of this period are pastels or softened colours. Most common among these are ‘thirties green’, pink, lavender, a buttery yellow, a light blue or blue green, and soft brown or tan. Popular solids also included a strong burgundy, a bright, clear red and a bright clear blue’. 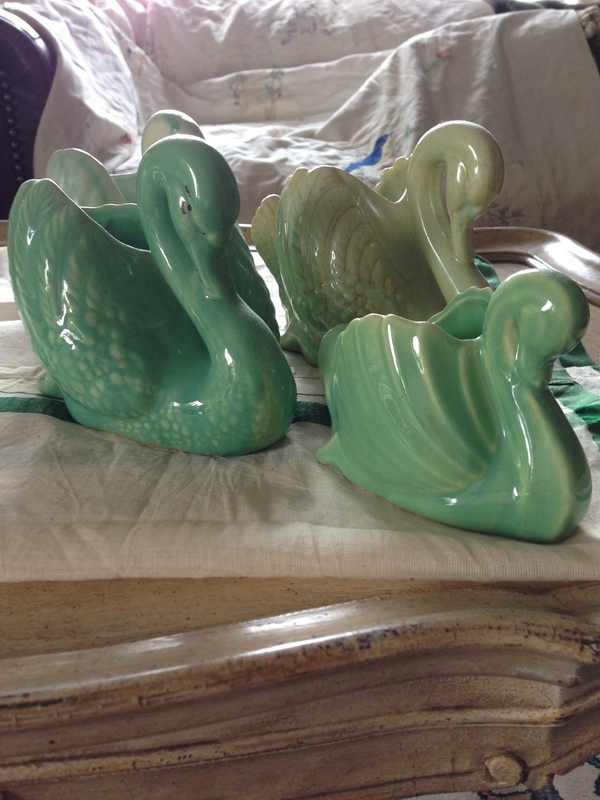 If you have the chance to buy reproduction or vintage fabric in these shades, don’t hesitate. 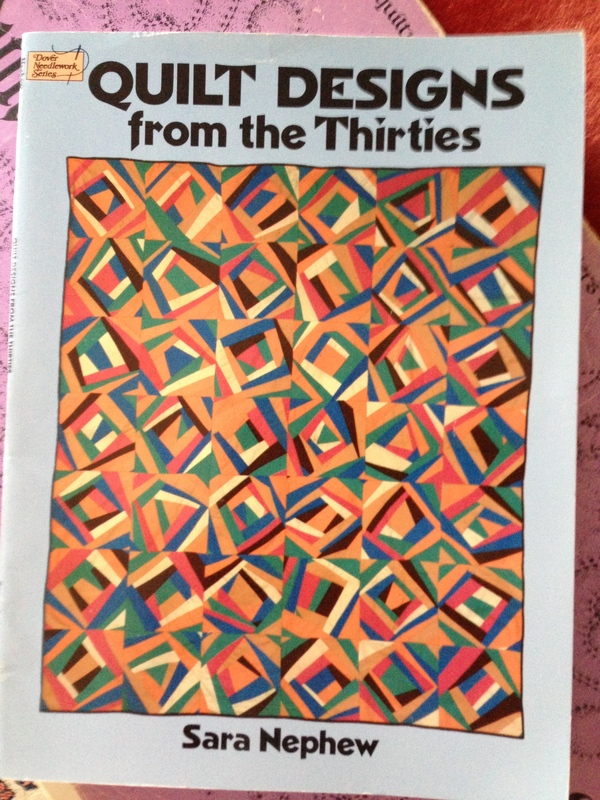 It is invaluable in reproducing quilts with the look of this era. Reproduction Green, pieced with contemporary, vintage and reproduction fabrics. 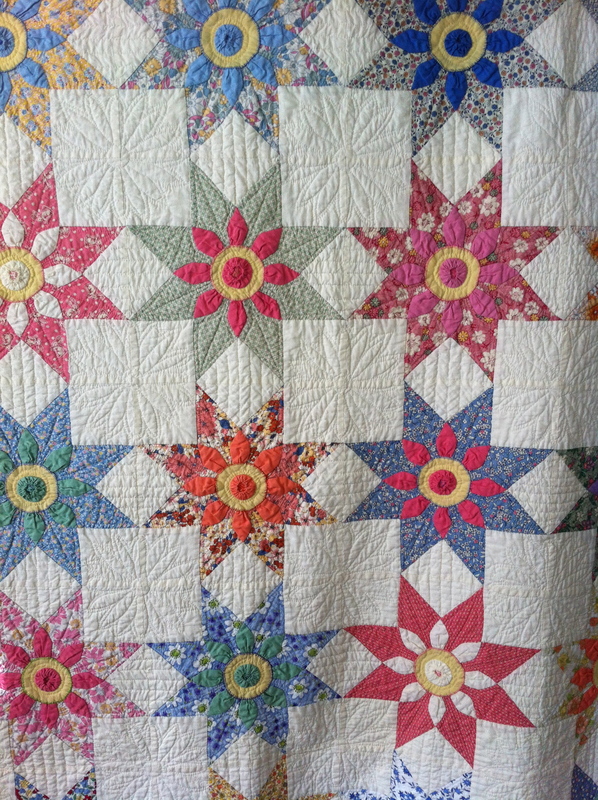 Missouri Daisy quilt made with reproduction and vintage fabrics. Includes some feed sacks. I love working with both vintage and reproduction fabrics from the 30s and 40s and look forward to sharing future posts on All Things Thirties. 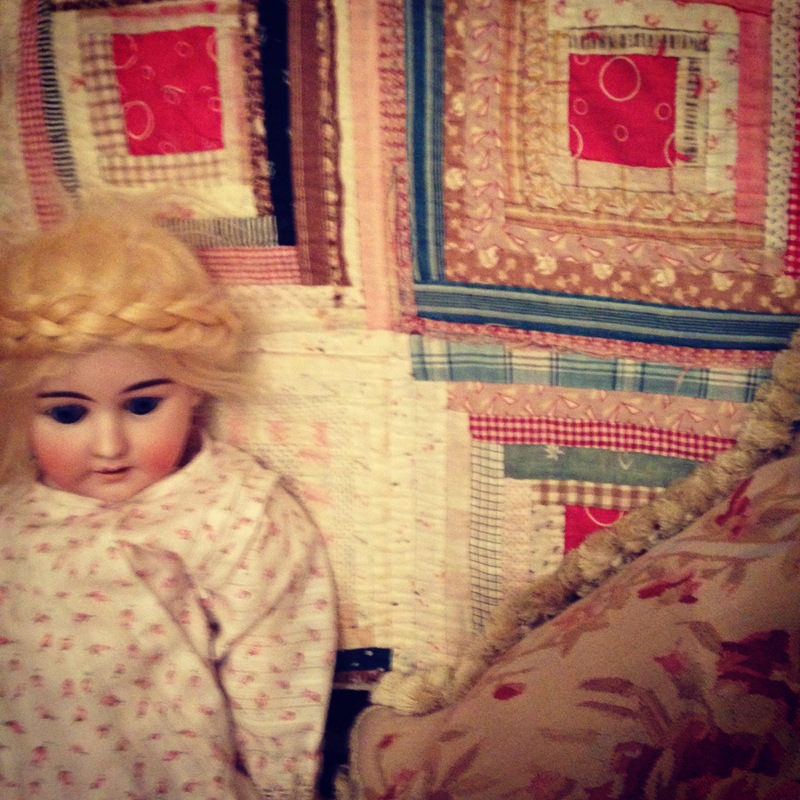 These two quilts came into my collection from ‘The Donnellys’. They purchased the Four Poster Bed quilt in 1997 in Groton, Massachusetts, USA from The Quilt Loft. This was owned by Diane Reese who has a Master’s Degree in Antique American Textiles from Boston University. The quilt is dated circa 1876, which is substantiated by the fabrics used as they are very distinctive. A lovely fine red and white stripe fabric was used for the sashing, borders and binding. 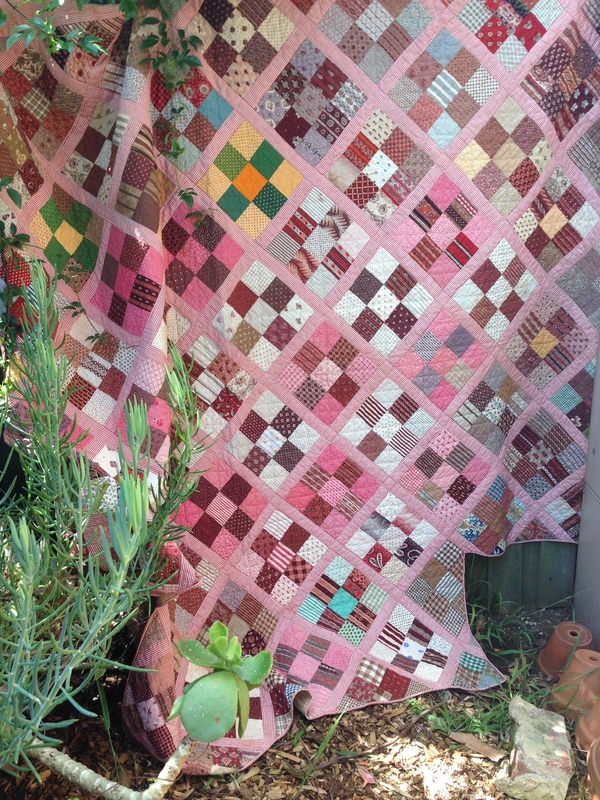 The quilt is backed with a coffee coloured linen type fabric that was possibly a homespun fabric. 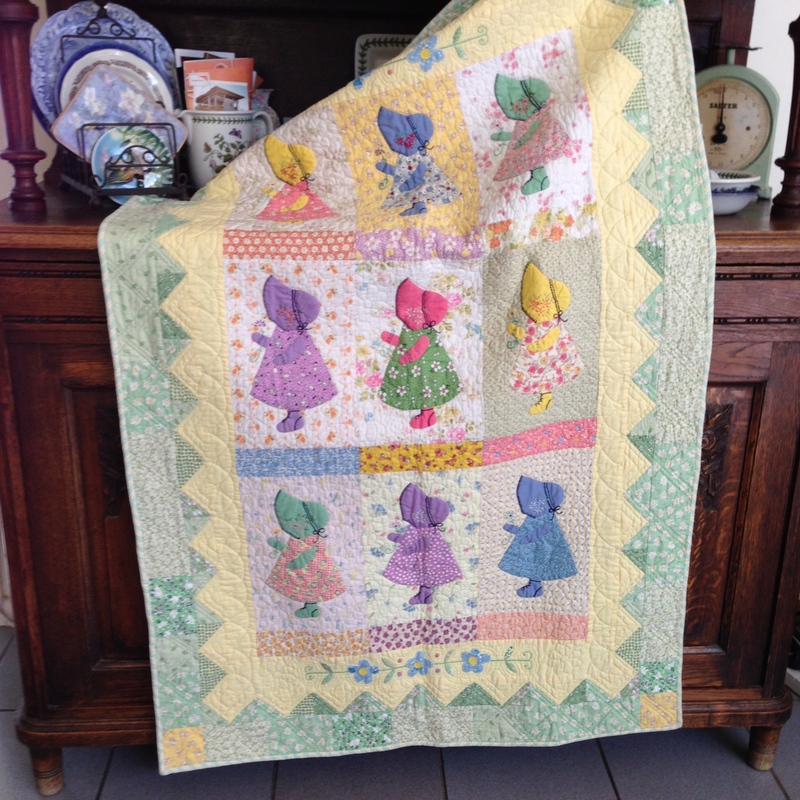 It is beautifully pieced and features well executed hand quilting. 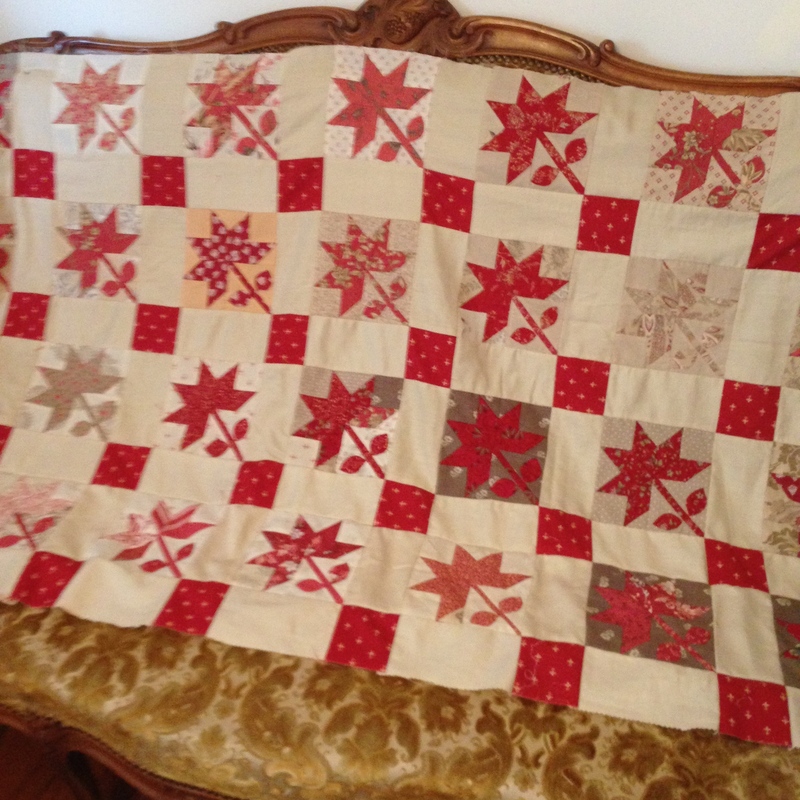 The red and white stripe fabric sets off the nine patch blocks beautifully and lends the quilt a timeless quality. 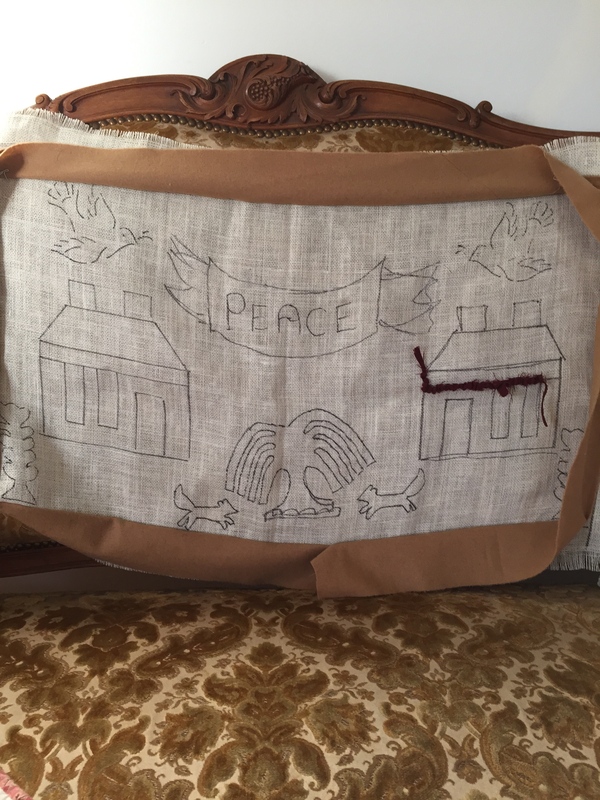 There is no other information available regarding this quilt but Bernie and Eileen did see George Washington’s bed at Mt.Vernon in Virginia, it was a four poster and they were surprised that it was so short. 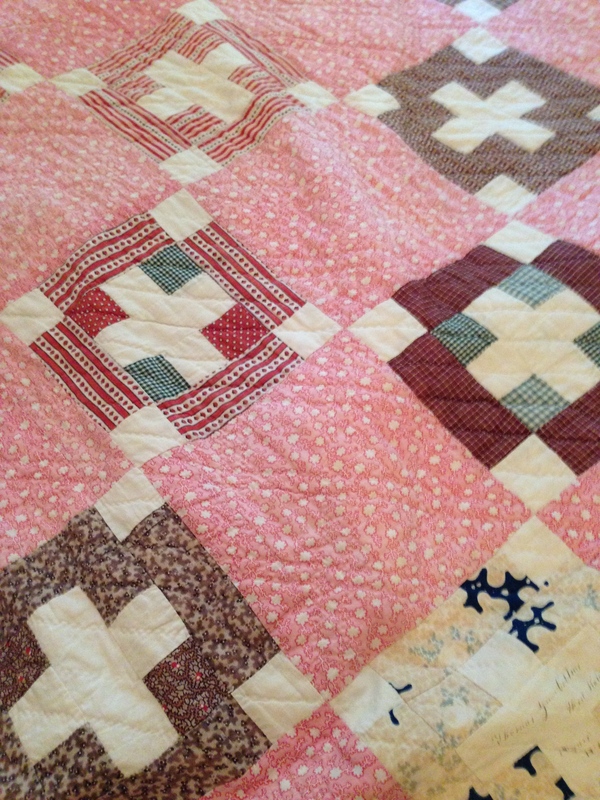 The Log Cabin quilt was passed on to me by Eileen and Bernie as they thought I might have the time and patience to repair this very old but still beautiful quilt. It contains a stunning collection of fabrics including many shirtings. It is very faded and has worn to shreds in some sections. 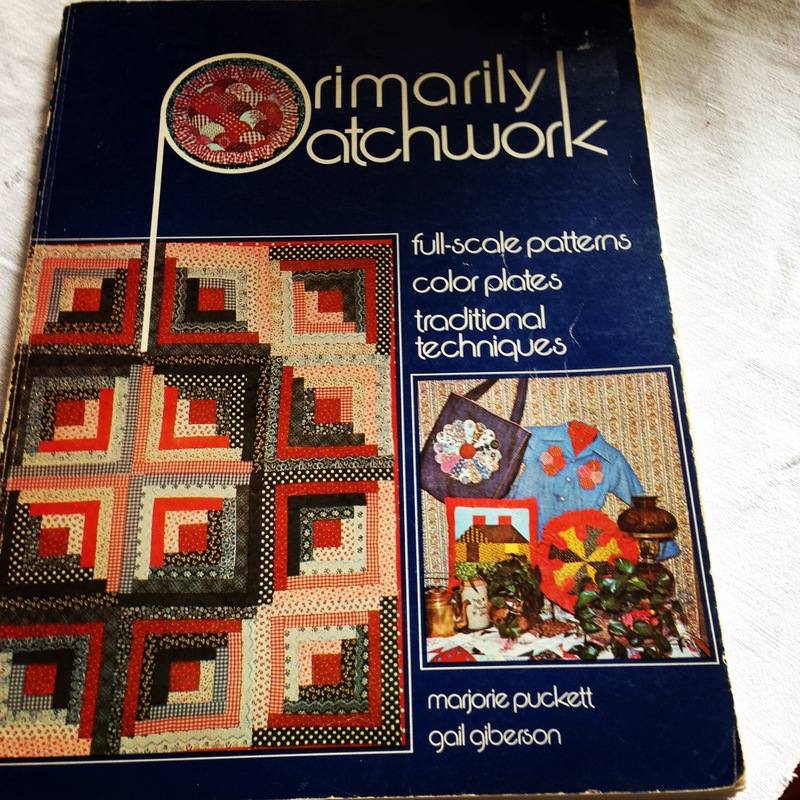 Primarily Patchwork published in 1975 includes a detailed construction method of foundation piecing log cabin quilts. However, the worn areas allow for studying the method of construction. The strips have been foundation pieced onto squares of patterned and plain fabrics. 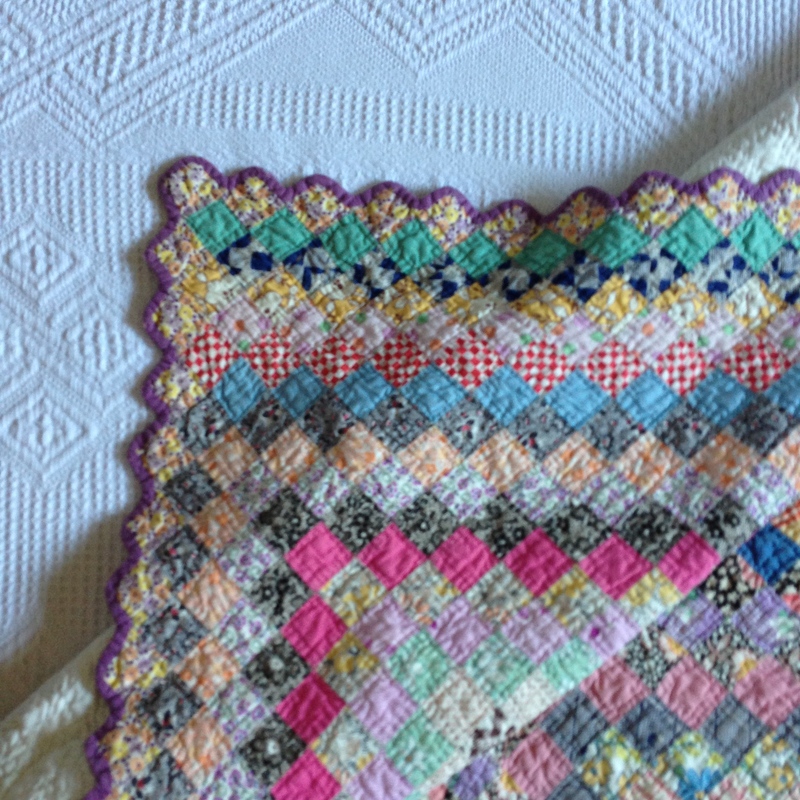 The squares were then stitched together and backed with a plain homespun. 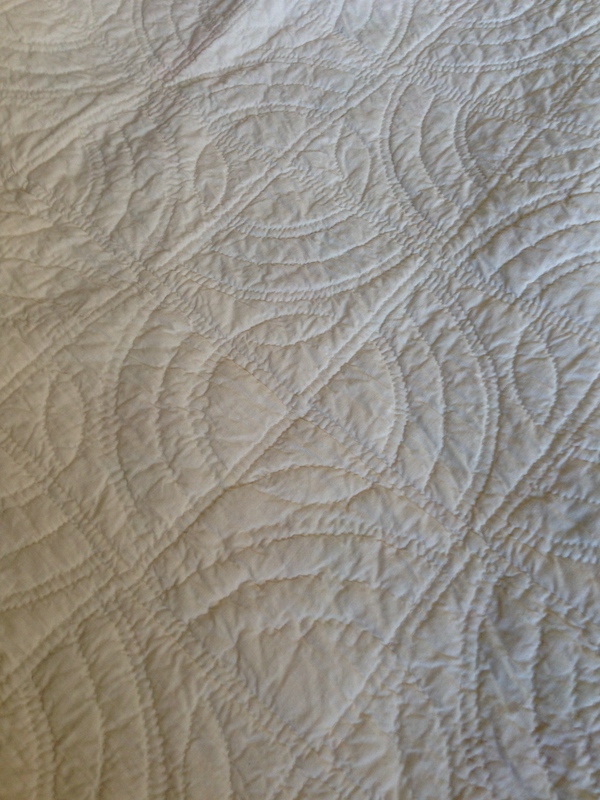 There is minimal hand quilting, also with a linen or coarse cotton thread. 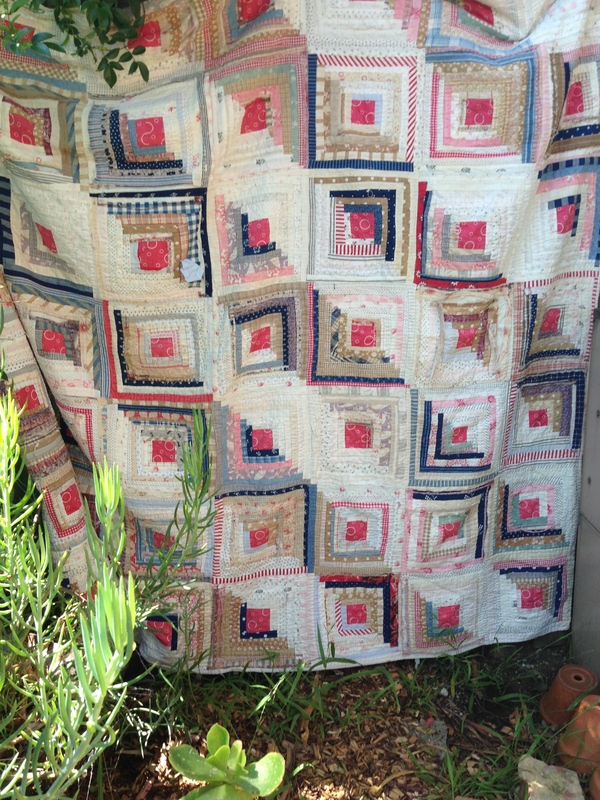 The Donnelly’s believe this quilt to be circa 1850s to 1860s. 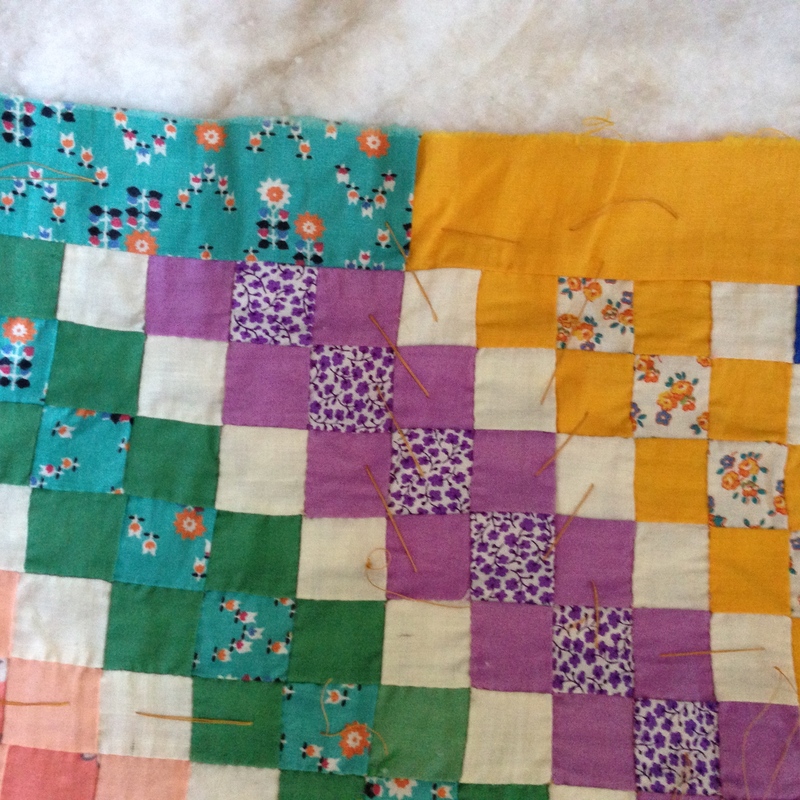 The process of repairing this quilt is ongoing. I am re-stitching the strips back onto their foundation block and in some instances the fabrics have frayed away completely. I trim these off to reveal the foundation fabric underneath which is quite fascinating to discover. 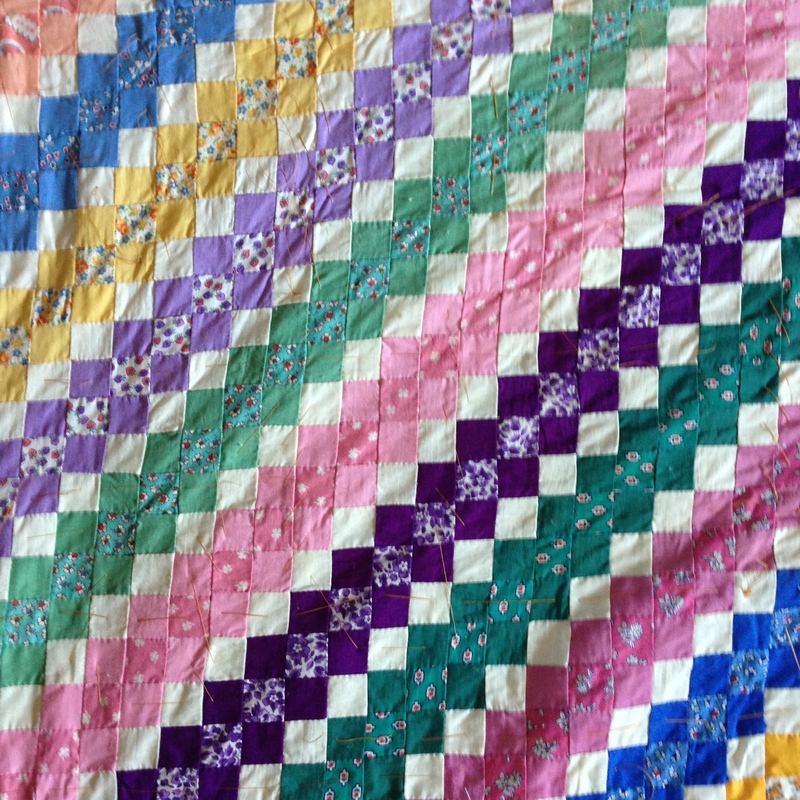 Although the Log Cabin quilt is very fragile now, its beauty will be enjoyed for another generation and provide a unique study of the old fabrics.